We summarize major findings and best-practice recommendations from three Volcano Observatory Best Practices (VOBP) workshops, which were held in 2011, 2013 and 2016. The workshops brought together representatives from the majority of the world’s volcano observatories for the purpose of sharing information on the operation and practice of these institutions and making best practice recommendations. The first workshop focused on eruption forecasting, the second on hazard communication, and the third on long-term hazard assessment. Subsequent VOBP workshops will address additional issues of broad interest to the international volcano observatory community. The objective of VOBP is to develop synergy among volcano hazards programs and their observatories internationally, so as to more rapidly and broadly advance the field of applied volcanology. Each of the workshop summaries presented here include best practice recommendations for consideration by the world’s volcano observatories. The online version of this article ( https://doi.org/10.1186/s13617-019-0082-8) contains supplementary material, which is available to authorized users. Risks posed by volcanic eruptions continue to grow as populations near active volcanoes and air traffic over them continue to increase; however, in recent decades, enhanced technical capability of volcano observatories and their associated scientists to detect and analyze unrest and provide actionable information and eruption forecasts have reduced risk and minimized loss of life and property (Loughlin et al. 2015; Auker et al. 2013). This capability carries with it the responsibility to construct the best possible practices of monitoring, data interpretation, and hazard communication to support risk-mitigation decisions, such as whether and when to evacuate populations and/or restrict travel and commerce in order to save lives and property (Bazelon 1979; Miller and Jolly 2014; Papale 2017, Bretton et al. 2018a, b). The basis for interpretation of monitoring data with respect to near-term hazards remains largely empirical, although forecasts are becoming more quantitative based on an improved understanding of the physics of causative processes (Sparks 2003) and the use of statistical methods (e.g., Newhall and Hoblitt 2002; Marzocchi and Bebbington 2012). With the exception of professional response teams (Pallister 2015) and observatory-based responders at especially active volcanoes, critical experience may come first-hand only a few times during the career of an individual observatory-based scientist. However, much of the advance in near-term eruption forecasting and risk mitigation depends upon relating monitoring observations to volcanic outcomes (e.g., McNutt 1996; Chouet 1996; Iguchi et al. 2008; Aiuppa et al. 2010; White and McCausland, 2016, White and McCausland 2019; Segall 2013; Selva et al. 2012) and in effective communication of hazards during crises (e.g., Ishimine 2016; Andreastuti et al. 2015; Fearnley et al., 2018a and references therein). It is therefore important that lessons learned be shared internationally, so that a consensus on, and a useful guide for, volcano observatory best practices can be developed. Under the aegis of the International Association for Volcanology and Chemistry of Earth’s Interior (IAVCEI) and its Commissions on Volcanic Hazards and Risks and World Organization of Volcano Observatories (WOVO), the Instituto Nazionale di Geofisica e Vulcanologia (INGV) and the United States Geological Survey (USGS) are convening a series of Volcano Observatory Best Practices (VOBP) workshops. Additional support comes from the United States Agency for International Development (USAID), the Global Volcano Model network (funded through UK Research and Innovation (UKRI) and the European Union EUROVOLC project. The Group on Earth Observations (GEO) and United Nations Educational, Scientific and Cultural Organization (UNESCO) have also endorsed the workshops. The first Volcano Observatory Best Practices workshop on Near-Term Eruption Forecasting took place on 11–15 September 2011 (VOBP1) and the second, on Communicating Volcanic Hazards, took place on 2–6 November 2013 (VOBP2). 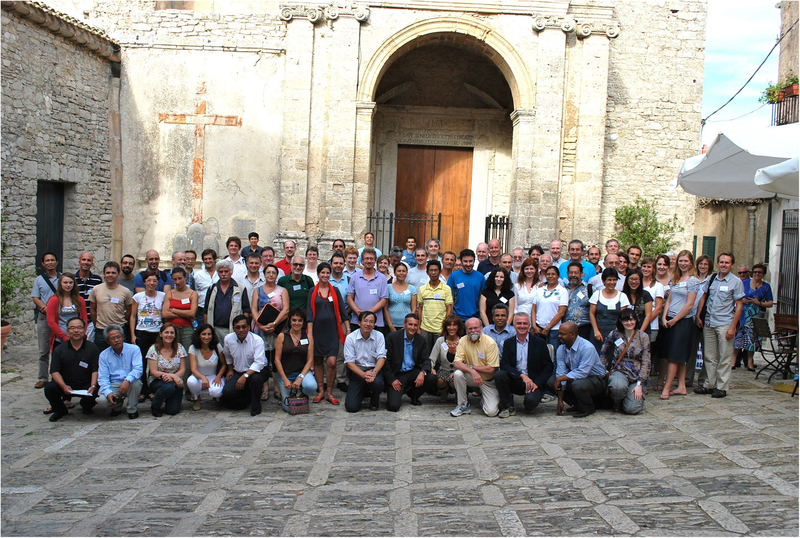 Both of these workshops were held at the “Ettore Majorana” Foundation and Centre for Scientific Culture in Erice, Sicily, Italy. A third (VOBP3) workshop on Long-term Hazard Assessment took place on 15–18 November 2016 in Vancouver, Washington, USA, near the USGS Cascades Volcano Observatory. A fourth workshop, on Observatory Crisis Operations is being planned. In this document, we summarize key findings and best-practice recommendations that emerged from the first three workshops. Although there are many regularly held meetings that encompass important themes of volcanology, such as the General Assembly of IAVCEI, and meetings of the American Geophysical Union (AGU), the European Geophysical Union (EGU), and the Asia Oceania Geosciences Society (AOGS); these naturally place an emphasis on science, not on observatory practices or operations. CoV (Cities on Volcanoes) meetings organized by IAVCEI offer a time for discussing more directly issues of relevance in volcanic hazards, risk evaluations and broader social impacts of volcanism. Yet, none of those meetings is focused on illuminating best practices for daily operations of volcano observatories. VOBP meetings fill that gap, as they are specifically aimed at volcano observatories and their cooperating partners. According to their aims, the discussion at VOBP meetings is kept at the practical level, with the aim of identifying operational needs and sharing best practices to meet those needs. Every effort has been made to include as much of the observatory membership of the World Organization of Volcano Observatories (WOVO) as possible. Although not complete, the workshops probably achieved the most participation by WOVO members of any meetings to date (Fig. 1; Additional file 1). The objective is to develop synergy among volcano hazards programs and their observatories internationally, so as to more rapidly and broadly advance the field of applied volcanology. The circumstances in which volcano observatories find themselves, including risk governance structure, societal expectations, and resources upon which they can draw, vary greatly. In spite of this diversity, in many cases general principles of observatory best practices have been identified. In other cases, multiple practices to meet a common goal have been identified. Over the past 50 years, there have been several publications that summarize experience and practices of volcano observatories. The first of these was the UNESCO-booklet “The Surveillance and Prediction of Volcanic Activity: A Review of Methods and Techniques,” published in 1972. The volume comprised individual review papers on monitoring techniques including seismology, geodesy, and gas chemistry by the leaders in the field at that time. In 1985, UNESCO’s United Nations Disaster Relief Office (UNDRO) published a comprehensive volume entitled “Volcano Emergency Management” (UNDRO 1985). An outgrowth of meetings held by UNESCO in 1978 and 1980, the volume sets forth to “distil from past experience in various parts of the world some general principles of organization and practice which, it is hoped, may prove of some validity.” Chapters cover: the nature of volcanic hazards, examples of volcanic disasters, hazard assessment and prediction, emergency planning, perception and acceptance of risk, communications, and examples of organizational structures for disaster management. As such, it is wider in scope than the discussions reported here. The general principles of practice now remain much the same as then. What has changed are major advances in monitoring, computational and communication technologies, and the accumulation of experience and scientific knowledge during eruptions of geophysically and geochemically monitored volcanoes. In developing best practices for volcano observatories, we followed principles of the Hyogo Framework for Action 2005–2015 (UNISDR 2005) and the Sendai Framework for Disaster Risk Reduction (UNISDR 2015) which emphasizes the role of science and technology (Aitsi-Selmi et al. 2015). Volcano Observatories provide scientific evidence to support decision-making by partners (e.g. civil protection) who implement disaster risk-reduction measures (as detailed in Additional file 2). Volcano observatories have existed since the founding of the Vesuvius Volcano Observatory in 1841 as a central collection point for synthesis and interpretation of geophysical monitoring data and other observations. As such, they are institutions created to provide as informed and clear an insight as possible into the hazards presented by a volcano or group of volcanoes. Through modern technology, an observatory no longer needs to be contained within a building, although many are. It nevertheless remains a group of people, however widely distributed, dedicated to their tasks of monitoring, observing, analyzing and interpreting various real-time and near-real-time data, warning of unrest, eruption or changes of activity from one or more volcanoes, and assessing longer-term hazards. As data streams grow in number and complexity and observatory staff and collaborators become more geographically dispersed, observatory operations have become vastly more complex. For example, the types of monitoring data available have expanded with advances in technology (e.g., access and interpretation of satellite data, increased ability to monitor multiple species of volcanic gases, improved seismic, infrasound and GPS networks (Sparks et al. 2012)). Such advances require specialized expertise which may not be available “in house” to all observatories. Similarly, advances in hazard communication methodologies have enabled more effective warnings and subsequent mitigation actions. Consequently, collaboration with technical and social-science communities beyond the defined physical observatory are needed to more fully monitor, understand and communicate volcanic unrest and eruption hazards. 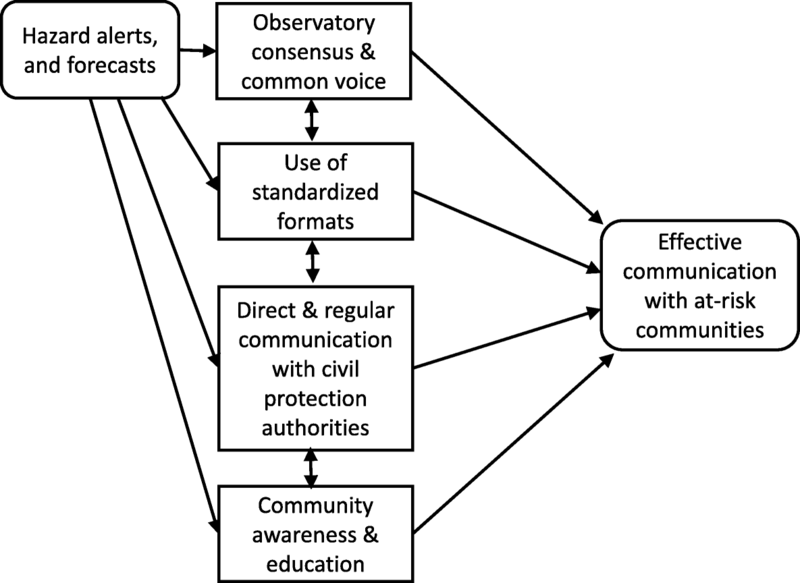 Finally, experience shows that at-risk communities, decision-makers, and other stakeholders should participate in discussions around hazards long before a crisis if the information and warnings an observatory provides are to produce successful outcomes (Aitsi-Selmi et al. 2015). It takes time to build trust and credibility and those delivering a message must work with Disaster Risk-Reduction (DRR) partners to develop understanding of the socio-cultural context within which the message will be received. Even today, however, there are recurrent examples of warnings that were unheard or unheeded, emphasizing the need for strong partnerships between scientists and decision-makers and effective two-way communication with those at-risk. Volcano observatories serve as the point of contact for scientific information related to volcanic activity to authorities, the media, and the public at large. The observatory is the place where scientific credibility is established and trust with stakeholder communities is nurtured. Generally, but not universally, it is a separate civil authority (or authorities) that is responsible for the decisions and actions to mitigate risk from volcanic activity. Such decisions consider mitigating actions in the context of legal, social, and economic factors, as well as the government’s capacity to implement them. As used here, the communication passed from an observatory to governmental authorities and the public regarding the probability of future volcanic events constitutes a forecast. A principal goal for a volcano observatory is to accurately communicate results of scientific evaluations and forecasts together with the associated uncertainties. The most critical kind of forecast, because it may require immediate action, is a near-term forecast addressing possible events in the coming hours, days, weeks, or a few months. For a major eruption, the primary mitigating action for emergency managers is to evacuate and restrict access to hazardous zones, and to notify aviation authorities of an impending threat of ash clouds and ashfall. Issuing a forecast too early during an episode of growing unrest may result in unnecessary hardship and economic loss, besides substantially increasing the uncertainty of the forecast. A forecast issued too late is one that provides inadequate time for effective communication and mitigation. In comparison, long-term forecasts are included in volcano hazard assessments, along with information on potential hazards and impact areas (typically shown in volcanic hazard zonation maps; Crandell et al. 1984). Long-term hazard assessments are useful both for land-use planning decisions and as an essential background and framework for use in near-term forecasting. Although there have been disastrous failures to warn of volcanic activity, increasingly volcano observatories have been responsible for near-term forecasts that (along with many other factors, e.g., community education, mitigation actions by civil authorities, etc.) have saved a minimum of 50,000 lives during the twentieth Century (Auker et al. 2013). As with other fields of practice, it has become evident that a concerted effort to share and evaluate experiences and to identify common principles of operation improves performance. This is especially true for volcano observatories, because often the experience for a single observatory may be gained in events spaced many years apart, whereas globally, eruptions are monitored by observatories many times per year. Such sharing has occurred at scientific meetings for many years, but the VOBP workshops are the first in decades in which international scientists focused on observatory practices have met. What follows is a distillation of important principles that emerged from these discussions. The United Nations Global Assessment Reports (GAR) are global assessments of disaster risk reduction containing reviews of the natural hazards that affect society. The 2015 edition of the GAR was the first to include volcanic hazards (GAR 2015). The GAR15 cites background reports from the Global Volcano Model network (GVM 2014; Loughlin et al. 2015) for examples of US $300 million in losses from the 2010 eruption of Merapi volcano, Indonesia (BNPB 2011) and 5 billion Euros in aviation-related losses from the 2010 eruption of Eyjafjallajökull volcano in Iceland (Ragona et al. 2011). These reports note that more than 800 million people in 86 countries live within 100 km of a volcano that could potentially erupt. The countries with the greatest number of people exposed are Indonesia, the Philippines and Japan; however, in some small countries, a higher proportion of the population is exposed, for example on small island states such as Montserrat, St. Vincent and the Grenadines (Loughlin et al. 2015). Further, the impacts from volcanic ashfall and drifting ash clouds affect economic activity and the environment far beyond the locality of the eruption. It is clear that volcanic risk is an international issue, which crosses national borders and requires international cooperation, such as is inspired by the VOBP meetings to develop best practices to reduce volcanic risk. Because there was significant overlap between the topics discussed in the three VOBP workshops, especially with regard to communication and forecasting, we have chosen to discuss the workshops in the following order: VOBP3 (Long-term Volcanic Hazard Assessment), VOBP1 (Near-term Eruption Forecasting), and VOBP2 (Communicating Volcanic Hazards). 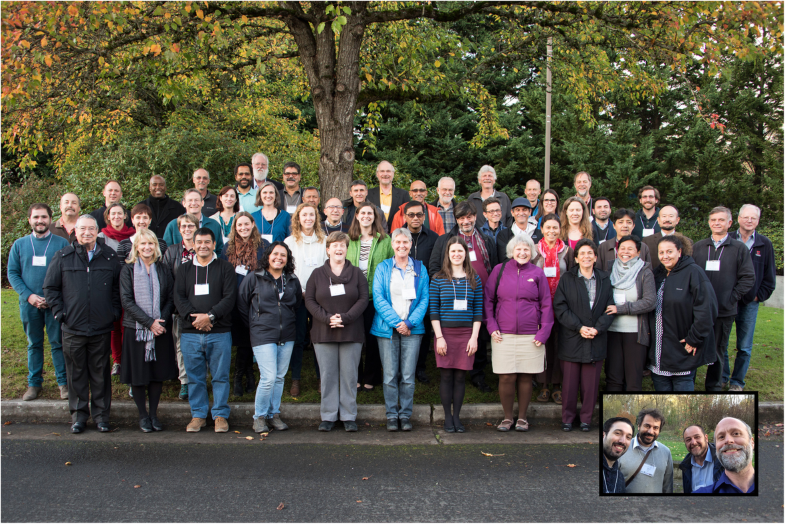 Seventy-two participants representing volcano observatories and partner organizations from 20 nations participated in VOBP3, which was held in Vancouver, USA (Fig. 2; Additional file 1). Ten graduate students from nearby universities observed the proceedings. In 1959, the International Association of Volcanology recommended “the permanent observation of active volcanoes by volcano observatories, work toward making eruption forecasting reliable, and notification of governments of regions regarded as dangerous in the neighborhood of volcanoes, having considered all the various possibilities” (Géze 1959). Throughout the subsequent decades it became widely recognized that volcanic hazard maps are a principal means of communicating hazard information and one of the primary elements of long-term volcanic hazard assessments. During the period between 1960 and the present, in addition to monitoring, forecasting and warning, volcano observatories world-wide have taken on the responsibility for long-term hazard assessment, the latter mainly through intensive programs of scientific study and publication of a wide variety of hazard maps and assessment reports. The first U.S. volcano hazard assessment was the seminal report by Dwight Crandell and Don Mullineaux on the volcanic hazards at Mount Rainier (Crandell and Mullineaux 1967). A landmark event in volcanology was the eruption of Mount St. Helens in 1980, and the prescient forecast of the eruption by Crandell and colleagues Mullineaux and Meyer Rubin 5 years earlier (Crandell et al. 1975). The value of the long-term hazard map they had published in 1978 (Crandell and Mullineaux 1978) became immediately evident, as this map was used as a framework for subsequent hazard maps that were used during the months preceding and following the 18 May 1980 eruption (Miller et al. 1981), in which monitoring data and qualitative probabilities (“large, medium and small”) were assigned to areas subject to pyroclastic flows, lahars and ashfall. The rate of hazard assessment and map publication greatly increased internationally during the 1980’s based mainly on geological mapping and directly-observed historical events. During this period, a series of “red book” hazard assessments and zonation maps were published by the Volcanological Survey of Indonesia (now known as the Center for Volcanology and Geologic Hazard Mitigation (CVGHM; or in Indonesian, the Pusat Vulkanologi Mitigasi Bencana dan Geologi, PVMBG)). A hazard map of Nevado del Ruiz was made during the year before the 1985 eruption (Cepeda et al. 1985), but tragically, crisis communication to Armero and other towns at risk was not effective and 25,000 died as a result of the lahars of 13 November, 1985 (Voight 1990). In contrast, a hazard map that was quickly prepared by Philippine Institute of Volcanology and Seismology (PHIVOLCS) and USGS during the months preceding the 15 June 1991 VEI 6 eruption of Mount Pinatubo was used to forecast hazardous areas, proved to be remarkably accurate, and contributed to saving thousands of lives (Punongbayan et al. 1996; Tayag et al. 1996; USGS 1997). The 1980’s and 1990’s began a period that continues to today, in which statistical and numerical models are combined with geologic and historical data and with large data sets (e.g., wind-field data and global databases) to create long-term probabilistic hazard assessments and maps. Here we summarize the current practice and recommendations for next-generation long-term volcanic hazard assessments, based on the input from participants in the third Volcano Observatory Best Practice workshop. Several components are considered essential for long-term volcanic hazard assessments. These fall within the two major categories of information necessary for volcanic-hazards assessments of Crandell et al. (1984): “Records of past eruptions” (Geologic information as used here) and “Quantification of hazards” (Probabilistic forecasts and models as used here). Basic descriptions of volcanic hazard phenomena are typically included in long-term hazard assessment document. Such descriptions provide the non-specialist user with a conceptual framework to understand the phenomena and their potential hazards. “Ground truth” for hazard assessment is provided by geologic studies, including stratigraphy, geochronology, physical volcanology, geochemistry, petrology, geomorphology and geologic mapping. Information derived from these studies establishes the range of possible eruptive styles and magnitudes as baselines of past activity, and provides eruption frequency and magnitude data for probabilistic analysis. Geologic maps provide the spatial framework for a basic volcanic hazard map, which uses the character and extents of past volcanic deposits as a guide to potential areas that will likely be affected in the future. Hazard maps may be complemented with results from flowage and ash-fall simulation models to extend the knowledge gained from deposits, and to graphically illustrate the potential effects of future eruptions. The resulting composite hazard map is consequently both a record of past impacts and a generalized forecast map for future impacts. A long-term hazard map can be updated and made more specific during a crisis as monitoring information and probabilistic analysis enables specific scenarios to be evaluated and used in warnings. A number of volcano observatories use their long-term hazard maps in this manner (“Prioritization and customization of hazard assessments and maps to meet user needs” section ). Other observatories, working in partnership with emergency managers and local communities, take the hazard map farther into the realm of risk reduction by creating volcanic hazard mitigation maps, which not only show areas of relative hazard, but also specify evacuation routes and zones (Surono et al. 2012) and some even include instructions to the public on appropriate responses under different scenarios, such as in the Mount Fuji volcanic hazard map (https://www.city.fujiyoshida.yamanashi.jp/div/bosai/html/hazard_map/print.pdf). Probabilistic forecasts, typically using methods such as Bayesian Event Trees (BET; Newhall and Hoblitt 2002; Marzocchi et al. 2008; Marzocchi et al. 2012; Selva et al. 2018) and based on geologic information, are increasingly considered essential components of long-term hazard assessments (e.g., Marzocchi et al. 2010; Sandri et al. 2012). Although, these methods are more commonly applied in near-term forecasting (“Probabilistic forecasting enables quantification of volcanic hazards and their uncertainties, and supports long-term mitigation planning” section); Newhall and Pallister 2015, probabilistic analyses are also used in long-term assessment, as at Vesuvius (Neri et al. 2008). Event-tree analysis requires the systematic assembly and evaluation of extensive data and references on past eruptions and global analogues, which are then used to constrain the probabilities assigned in the tree. Further, event trees require the consideration of all possible future hazardous scenarios. In short, the “homework” involved in preparing scenario-based event trees is an important step toward being prepared for future crises. In addition, carrying a long-term scenario-based probabilistic analysis through to vulnerability and risk can provide a quantitative basis for prioritization, and for communication with decision makers and at-risk communities (“Relationships between communication and responsibility, and the importance of constant communication between observatories and civil authorities” section; Newhall 1982; Sandri et al. 2012). The long-term eruptive history of a volcano or a volcanic region and the distribution of the products of past eruptions are the first and most basic criteria used for estimating the probability of future eruptions and their areas of impact (e.g., Shimozuru 1983; Sudradjat 1986; Lirer et al. 2001; Hall et al. 1999; Becerril et al. 2014; Clynne et al. 2012) to name but a few of the hundreds of examples). Most long-term hazard assessments and zonation maps are based primarily on these types of data. The eruptive history can also be used to estimate probabilities of future eruptions and their impacts. An example of such an analysis is that of Nathenson et al. (2012), who fit several types of probability distributions to records of eruptions at the Lassen volcanic center and to records of large eruptions throughout the Cascade Range of the U.S.A. These distributions were used to calculate the probability of subsequent eruptions in the next year and the annual probability of ashfall throughout the region. In another example, information from past eruptions was used by Sandri et al. (2012) in a probabilistic assessment of potential base-surge impacts for Auckland, New Zealand. They used a Bayesian Event Tree (BET) approach and carried the resulting probabilistic assessment through to support cost-benefit analysis in support of decisions for both long- and near-term mitigation. This category includes statistically-based models or deterministic models that can be run repeatedly (e.g., with a Monte Carlo approach). Use these models for rapid assessment and portrayal of hazard zones for broad regions (such as an entire volcano) where considerable uncertainty exists about the locations and sizes of future flows. It is important to acknowledge that the statistical uncertainty of model results reflects the effects of natural variability among diverse settings. It is also possible to recalibrate the coefficients of statistically based empirical flow models for specific settings, but only if adequate data exist to generate meaningful statistics (Iverson et al. 1998; Widiwijayanti et al. 2009). Monte-Carlo-based ash-dispersion models are recommended for use in long-term assessments both to evaluate specific eruption scenarios and to estimate probabilities of ashfall (Bonadonna et al. 2005; Schwaiger et al. 2012; Mastin et al. 2013; Bustillos et al. 2016). There is room for improvement of statistically-based empirical flow models. For example, commonly used flow model codes for lahar modeling can be extended to other flow types, such as debris flows, rock avalanches, and with appropriate caution to the dense, valley-constrained block-and-ash type pyroclastic flows. However, in the latter case, extreme caution must be used because of the fluidized nature of pyroclastic flows, and the common generation of deadly over-bank surges. Use physically based models to perform more detailed hazard assessments where prior knowledge warrants. Such models are useful to explore scenarios and get more detailed information (e.g., on velocities, concentrations, travel times, etc. 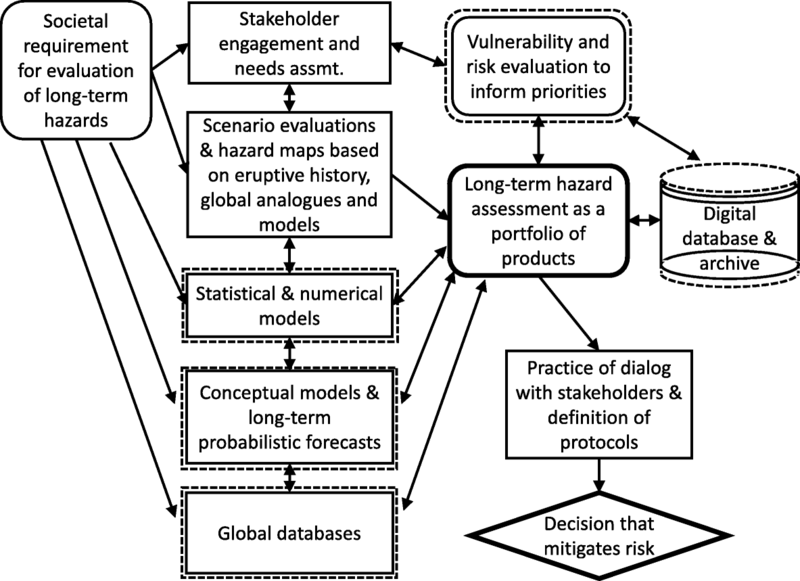 ), factors that are important in hazard (and risk) evaluations, and cannot be determined by simpler models (Sheridan et al. 2010; Iverson et al. 2016). Such models have great flexibility and explanatory power, but they also have more components—and more sources of uncertainty—than a simpler statistical model. Thus, they must be used judiciously if they’re used in a hazard forecasting mode. A physically based model can have excellent explanatory power but still have limited predictive power. Conceptual models are generalized representations of magmatic systems or processes. They are typically illustrated in cross-sectional diagrams. Such conceptual models are based on the past state of magma systems as inferred from petrology, geophysics and past episodes of unrest and eruption, combined with any available petrologic and geophysical monitoring data that constrain the state of the current magmatic system. In long-term hazard assessment conceptual models provide a means to relate eruptive history to magmatic dynamics and plumbing. They provide a logical means to constrain future eruptive behavior on the basis of geophysical and geochemical data from past eruptions (e.g., Dzurisin 2018). They also provide a conceptual framework for evaluation of the expected ranges and baselines of physical phenomena that are used in assessing potential future eruptive behavior (e.g., Pallister et al. 1992; Carlino 2012; Browning et al. 2015; Koyaguchi 2016; Sparks and Cashman 2017; Dzurisin 2018; and many others). Long-term hazard assessments need to address the frequency, size and the impacts of potential future eruptions. The paradigm “the past is the key to the future” is widely and appropriately applied in long-term assessment. Consequently, databases of past eruptive behavior are crucial. Long-term forecasts are weighted by the individual volcano’s geologic past, while also accepting that reconstructed eruption histories are typically incomplete, and consequently, a level of uncertainty must also be included in these evaluations. In addition, a volcano’s behavior can change as it evolves. It is important to be aware that the paradigm is not inviolate and to be on the lookout for any clues in the monitoring data, or in the eruptive history of similar volcanoes, to a potential change to a new state. A traditional approach is advocated in which geologic field and lab work (geology, stratigraphy and geochemistry) is used to establish a local database for long-term assessments, which is then combined with real-time monitoring data for use in near-term forecasting of the style, timing, and geographic extent of hazards. Added value can be attained through analysis of global databases on past eruptions (such as in the Volcanoes of the World (VOTW) database of the Smithsonian Institution’s Global Volcanism Program (Global Volcanism Program, 2013; http://volcano.si.edu/); although, one must be aware of the limitations, biases and default values that are inherent in such databases). Global and volcano-specific databases that catalogue the timing, magnitude and duration of eruptions, as well as periods of unrest that do not lead to eruptions, are essential elements for probabilistic hazard assessment and forecasting and most observatories maintain their own databases to aid in hazard assessment and forecasting. Currently, the most extensive global database of basic data on volcanoes that have had Holocene eruptions is the Volcanoes of the World (VOTW) database (Global Volcanism Program 2013), although it lacks precursory and eruption phase details and monitoring data that are needed for hazard assessment and probabilistic forecasting. Consequently, additional database projects to build on and complement the VOTW database are underway, such as WOVOdat (Newhall et al. 2017; http://www.wovodat.org/) and the Eruption Forecasting Information System (EFIS; Ogburn et al. 2016). In addition, the Global Volcano Model network has instigated a series of global relational databases that use GVP (Global Volcanism Program 2013) volcano identifiers to enable interlinking of data relevant to hazards and risk. Much of this work is focused on fleshing out and improving details of the data that are needed to improve near-term eruption forecasts through definition and analysis of analogue volcanoes, or to improve the knowledge base for specific types of volcanoes or hazards (e.g., Large Magnitude Explosive Volcanic Eruptions (LaMEVE; Brown et al. 2014). It is important to understand that the global databases, such as the VOTW, are incomplete and they have systematic biases, such as the greater reporting of low-VEI eruptions with time. A best practice recommendation to address this issue is first to expand databases to define rate-magnitude distributions for all analogue volcanoes in a similar state, then correct this distribution to take into account systematic biases in the database(s) used. Where detailed information is available on the time-frequency and time-volume relationships of a volcano, it becomes possible to evaluate statistical models that are aimed at assessing and forecasting long-term hazard assessment in a similar way to that the seismological community has applied such models to develop 30-year and 100-year return intervals for earthquakes. For example, Marzocchi and Bebbington (2012) evaluated different Bayesian statistical models to assess the long-term probabilities of eruptions at Campi Flegrei. It is anticipated that as improvements in volcano databases are made, additional quantitative probabilistic analyses will become possible for individual volcanoes. As in the VOBP workshops on forecasting and communication, there are important questions about the roles and value of probabilistic versus deterministic methods and about how uncertainties are best estimated and communicated. Conditional probabilistic event-tree analysis is becoming a widely used method for assigning probabilities to various outcomes during a near-term crisis response, in which monitoring data are available and have already defined a period of unrest. However, the role of long-term (unconditional) probabilistic analysis for currently quiescent volcanoes is more challenging. Such analyses typically rely on extensive records of past eruptions to establish thresholds and to determine annualized probabilities and associated uncertainties. Conditional long-term hazard quantification (conditioned to the occurrence of an eruption) may also be used to build evacuation plans because they say what may happen in case of eruption (this is the case for Vesuvius and Campi Flegrei (Selva et al. 2018; Neri et al. 2015; Macedonio et al. 2016). Consequently, conditional assessments are useful not only in short-term quantification, but also in long-term planning, even for volcanoes with infrequent eruptions. Statistical models have been applied to estimate eruption probabilities for volcanoes with frequent eruptions and/or extensive data on past eruptions (e.g., Salvi et al. 2006; Mendosa-Rosas and De La Cruz-Reyna 2008; Dzierma and Wehrmann 2010; Nathenson et al. 2012); however, the extent to which such models can be generalized and applied elsewhere is not known (Marzocchi and Bebbington 2012). How stakeholder needs are met by observatories varies according to the national regulations and laws that define the roles of most observatories and these regulations vary widely. Although all observatories deal with volcanic hazards, there is variation with respect to how hazards are communicated (e.g., issuance of Alert Levels, and direct versus indirect communication of warnings to the public and the media (Additional file 3; “Relationships between...” section). There is also a wide range in the responsibilities of observatories with respect to evaluation of vulnerability and risk; some are directly involved in such evaluations and have devoted significant resources to these pursuits; whereas others work with partners or share their hazard data as an input to such evaluations. In addition, there is variability in the degree to which observatories are responsible for mitigation of risk, such as prescribing or advising on areas to be evacuated, and the modes of legal authority and responsibility. There are practical considerations of budget, available expertise, cultural and societal norms, and the level of risk tolerance, all of which contribute to the wide variety of content and character of long-term volcano hazard assessments globally (“Relationships between...” section). In this report, we focus mainly on volcanic hazards, the subject of vulnerability assessment and risk mitigation is suggested as a topic for a future VOBP workshop (“Mitigation of volcanic...” section). Even within individual nations there are differences in the methods used and reported in hazard assessments, which result from these factors, as well as from regional differences in concern about ground-based versus airborne hazards. In addition, population density and distribution and the dominant types of eruptive behavior at the volcano in question play a role in the content and prioritization of hazard assessments. Because of the variability in roles and responsibilities, it is generally agreed that with a few exceptions (e.g., alert levels for ash-cloud hazards to aviation), a single international standard for ground-based hazard assessment is not possible to-date. Instead, international best practice recommendations for development of scientific methods to improve hazard assessment and for the creation of products and services to meet stakeholder needs are considered appropriate and helpful. Community-level education and community-based mitigation strategies affect both near-term crisis response and long-term planning. Although the details of observatory engagement vary, there is wide agreement concerning the importance of working with communities and emergency managers at all levels throughout the volcanic cycle, and especially during periods of volcanic quiescence (“Relationships between...” section). International examples of long-term volcanic hazard assessments and hazard-zonation maps are cited here, along with explanations of how these assessments are used by emergency managers, and how they inform the development of a “next generation” of long-term hazard assessments. Most observatories produce a wide variety of volcanic hazard-assessment related products. During VOBP3, it was recommended that next-generation hazard assessments consist of “portfolios of products” designed to meet user needs. Further, it was suggested that such portfolios could be made available and archived as digital databases. Portfolios may include hazard assessment reports, maps, posters, succinct information statements (i.e., fact sheets about hazards and preparedness information), as well as baseline information, eruption scenarios, probabilistic analyses, and links to monitoring information. The GNS-New Zealand web page for volcanic hazards comes close to this approach by making a wide variety of information products available through links, including monitoring data, Volcanic Alert Levels (VALs; “Volcanic alert levels (VALs)” section), hazard bulletins and posters, as well as information on hazardous phenomena and how to respond during periods of volcanic unrest (https://www.gns.cri.nz/Home/Our-Science/Natural-Hazards/Volcanoes). During VOBP3, it was reported that Chile’s decision makers (at local to national levels) only want simple, basic maps to define exclusion zones; similar reports were shared by other observatories. However, a simplified map may be misrepresented and result in more extensive evacuations than are needed, as was the case during Cordón Caulle’s 2011 eruption. Consequently, at Cordón Caulle, more detailed hazard maps were constructed based on the stakeholder needs. In Indonesia, sector-based hazard maps are routinely created and used by CVGHM and civil protection partners during crisis responses in high-risk areas, such as near Merapi (Surono et al. 2012). In other high-risk urban and industrial areas, such as Naples, Italy, it was noted that providing new hazard maps during the advanced stages of a crisis could lead to disruption of trust and cause conflict. In such situations it is particularly critical that constant and productive interaction between scientists and decision makers takes place, so that even a relatively complex picture can be understood. A potential problem results from worst-case scenarios that are used for modeling in many traditional long-term assessment maps. Such maps are useful for long-term land-use planning, but unless they are well understood by stakeholders, they may result in overly conservative mitigation decisions. Implicitly or explicitly, the determination of a worst-case refers to a probability threshold and therefore to accepted risk, a concept that is best determined by society, not by volcanologists alone. For this reason, it is important that even events with very low probability are communicated and understood. Providing hazard maps over different time frames (e.g., the 10-year or 100-year or 1000-year assessment) may be a way to communicate the range of expected phenomena for frequently active volcanoes, although for infrequently erupting volcanoes this may not be practical. Selection of volcanoes and volcanic areas for new or additional hazard assessment work will need to take into account end-user needs, as well as relative threat levels, cost-benefit and available resources. As an example, Colombia sets priorities for new hazard assessments and maps according to four criteria: 1) perception of risk and necessity of information needs of communities, 2) level of unrest, 3) historical activity, and 4) potential explosivity. Similar methods of prioritization based on threat and available data are generally regarded as a best practice internationally and demonstrate that ultimately, threat levels and risk drive priorities for hazard assessment (“Minimal monitoring...” section). Geologic information on past eruptive behaviour and geologic maps showing the distribution of eruptive products, coupled with scenario-based model results and data from analogous eruptions remain as a foundation for long-term hazard assessments and hazard maps. Models that embed statistical analysis or simple models that can be used in a statistical way are recommended when conducting long-term hazard assessment. More complex numerical models inform understanding of processes, help explore hazardous scenarios, visualize the full range of hazardous phenomena, and inform simpler models. Both types of models are important in hazard assessment. A next generation of global databases is required to inform and validate long- and near-term hazard assessments, and extend geological data for individual volcanoes. It is recommended that next-generation hazard maps should be viewed as windows into digital databases and online libraries that serve multiple user needs. Hazard maps are but one of a portfolio of products that constitute a comprehensive hazard assessment, which should be tailored to meet user needs. Conceptual models and event-tree analyses are recommended to aid in hazard assessment. Conceptual models are useful in developing multiple working hypotheses, providing context for monitoring data and informing event-tree analyses. Event trees allow a range of possible outcomes to be evaluated in a probabilistic framework, help define gaps in knowledge, and provide a systematic way to assemble and archive supporting information that is important for both long- and short-term assessment. Officials need to be informed of all scenarios including those of low probability, and it can be useful to emergency managers to include key infrastructure (e.g., lifelines and other critical infrastructure) on hazard maps. Institutional responsibility and expertise determine the extent to which an observatory participates with decision-makers in recommending mitigation actions as part of assessments. As for near-term assessment, effective hazard-mitigation decisions based on long-term hazard assessment require constant relationships with decision makers. Observatories should engage stakeholders to inform them of how their expertise and products can meet their needs and to work together to design the most effective assessment practices and products. Effective communication of probabilistic results requires a practice of dialogue and mutual understanding with stakeholders, to ensure that the message is well received and not misunderstood. Long-term volcanic hazard assessments are informed by vulnerability and risk evaluations, which provide a means to prioritize new assessment work as well as the required sophistication and accuracy for subsequent hazard investigation and forecasts. Long-term volcanic hazards assessment requires that a wide range of processes take place, ranging from stakeholder engagement to geologic studies and modelling. A flow chart (Fig. 3) illustrates how these processes and the recommendations given here can be used ultimately to mitigate risk. 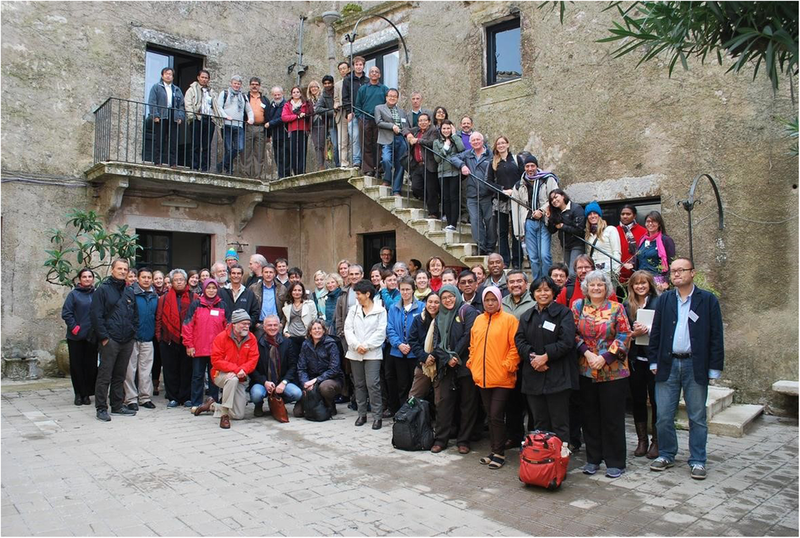 Eighty participants representing volcano observatories and partner organizations from 27 nations participated in the first VOBP workshop in Erice Italy (Fig. 4; Additional file 1). The meeting focused on the critical theme of eruption forecasting. The three-day workshop dealt with near-term forecasting at long-dormant stratovolcanoes (Day 1), frequently-active stratovolcanoes (Day 2), and at calderas (Day 3). The emphasis was on presentation and discussion of experiences in forecasting eruptions, both successful and unsuccessful, and led to the conclusions and best-practice recommendations summarized here. Pre-eruptive processes are usually characterized by extreme complexity, nonlinearities, and a large number of degrees of freedom (Sparks 2003; Marzocchi et al. 2012). These factors bring about an unavoidable source of uncertainty. No matter how well we know the appropriate equations and their parameters, complex nonlinear systems are inherently unpredictable in a deterministic sense, and in particular, for forecasting time intervals of hours or more. This aleatoric type of uncertainty concerning the pre-eruptive phase is therefore irreducible. However, once an eruption begins the number of unknowns decreases and the system settles into a pattern of behavior and uncertainty is reduced, sometimes even to the point that prediction is possible. An example was the prediction of dome-forming eruptions of Mount St. Helens in 1980–1986 (Swanson et al. 1983). Similarly, using the initial geometry of dome extrusion in the context of past behavior, it was possible to forecast the approximate timing and sites of dome collapse at Merapi volcano, Indonesia in 1996 (Ratdomopurbo et al. 2013). Empirically determined patterns of seismicity have also aided greatly in forecasting (e.g., Chouet 1996; McNutt, 1996; White and McCausland 2016, 2019) and probabilistic forecasts using event trees to evaluate multiple lines of evidence have been made at many volcanoes (see list in Newhall and Pallister 2015). At the frequently erupting, open-conduit Etna volcano, methods based on probabilistic analysis of geophysical time series (Cassisi et al. 2016; Ripepe et al. 2018) have enabled forecasting the occurrence of potentially threatening ash-rich lava fountains up to a few hours in advance, with a nearly complete success rate. It has even been possible to statistically forecast the most likely duration of the long-lived eruption of Sinabung volcano, Indonesia (Wolpert et al. 2016). Besides aleatoric uncertainty, pre-eruptive processes are also characterized by another source of uncertainty, epistemic. Epistemic uncertainty stems from the limited knowledge of the processes, i.e., most of the time we don’t know all the equations and parameters of the processes that characterize the pre-eruptive phase. This kind of uncertainty may be better characterized by increasing the physical and empirical knowledge of the pre-eruptive processes, and therefore increasing such knowledge represents a main goal of volcanologists. In addition, models of the natural world inevitably require simplifications and assumptions, so in addition to epistemic uncertainty, the models themselves will always have an element of “structural uncertainty” (Bojke et al. 2009). Uncertainties can be quantified through the mathematical concept of probability that may incorporate these types of uncertainty. The ubiquitous presence of uncertainty makes unavoidable the use of probabilities to forecast quantitatively volcanic eruptions. Depending on the available information and the approach adopted, probability may represent the expected frequency of a determined kind of event (e.g., Nathenson et al. 2012; Ripepe et al. 2018), or the degree of belief about the occurrence of one specific event, given the present state of knowledge. The quantification of forecasts in terms of probabilities may be difficult because of the limited understanding of the physics of the pre-eruptive process with respect to the complexity of the natural magmatic system, and the limited number of pre-eruptive data for past eruptions. Nonetheless, even a limited understanding and experiences collected from other volcanoes may be useful to quantify probabilities, as noted above. An example of this approach is the merging, in a proper and quantitative way, of the opinion of a community of experts (Aspinall and Cooke 1998; Marzocchi, et al., Marzocchi et al. 2008; Marzocchi et al. 2012; Newhall and Pallister 2015; Selva et al. 2012). The quantification of probability is of paramount importance for two main reasons: 1) Probabilities represent a fundamental scientific ingredient to plan quantitative, rational and transparent protocols for decision-making. In general, the cost and benefit of each mitigation action can be represented as a probability threshold that, when exceeded by the probability estimated by scientists, can justify the use of a mitigation action. 2) In an ideal case, transparent protocols for risk mitigation are defined in advance, in which the scientists estimate probabilities and the decision-makers decide acceptable probability thresholds. Such a protocol clarifies roles and responsibilities of each partner of the decision-making chain. However, in many real-world cases, the decision-maker may ask the scientists for both probabilities and thresholds. In such cases, guidance can be provided, e.g., in the form of a risk ladder, to aid in the understanding of the probability values (Keller et al. 2009; Keller 2011). Probabilistic forecasts are standard practice in meteorology, and in this context they are generally accepted and understood by the public. In many places, volcanic activity is much less familiar and may be more threatening to the public than weather phenomena. Consequently, and for a variety of reasons (e.g., lack of familiarity, complexity of forecasts, lack of statistical expertise) probabilistic forecast for volcanic phenomena may not be as well accepted (Constantinescu et al. 2016). It is anticipated that probabilistic forecasts will eventually become common practice at most volcano observatories worldwide, and indeed, a number of observatories are already using expert judgement and probabilistic event-tree analyses to guide their forecasts and warnings (Newhall and Pallister 2015). In cases where volcanic alert levels (VALs) are issued, probabilistic forecasts are one of the components used in assigning VALs, whether issued by observatories or by their civil protection partners (Additional file 3; “Volcanic alert levels (VALs)” section). Regardless of the degree to which forecasts are quantified with numerical probabilities, observatories work to provide those responsible for mitigation decisions with the most comprehensive picture of current situations and expected changes, and of the associated uncertainties. Ideally, these decision-makers then use such quantitative and qualitative volcanic-hazard evaluations, together with knowledge and evaluations from many other relevant disciplines (e.g., social sciences, economy, engineering, cost/benefit analysis, etc.) to define thresholds above which to start specific mitigation actions. By establishing background levels and thresholds, e.g., through recognition of patterns of precursory seismicity and other monitoring data, it is possible to detect volcanic unrest and forecast eruptive behavior with varying degrees of uncertainty (“Purpose” section; Sparks 2003, White and McCausland 2016; 2019). Real-time data from very basic seismic monitoring networks (e.g., in some extreme cases with data from only a single seismometer) can be effective, especially if the volcano has an historical track record that includes typical precursors. However, such minimal monitoring introduces considerable uncertainty and poses great risk, as a single point-of-failure can leave an observatory “blind” at critical times of crisis and multi-parameter monitoring enhances understanding. In addition to forecasts, it is also well established that eruption detection and ash-cloud tracking is critical for aircraft to avoid hazardous volcanic ash (“Timely and effective communications in support of aviation safety” section). In addition to seismic methods which require in situ networks, infrasound (Fee and Matoza 2013) and satellite data enable remote detection of explosive eruptions and ash-cloud tracking (Prata 2009; Pyle et al. 2013). But eruption detection alone provides limited time for avoidance and no time for route planning, factors that are essential for overall safety, continuity, and economy of aviation operations. In all cases, resilient and multi-parametric monitoring utilizing both in situ (proximal ground-based) and satellite sensors reduces uncertainty and improves an observatory’s ability to forecast eruptions and save lives and property. Forecasting the type and magnitude of eruptions is limited by the fact that to-date we still lack a commonly accepted framework to relate observed data on unrest to the magnitude of the expected eruption. As a consequence, such forecasts rely heavily on empirical or simple statistical analysis of historical and geological eruption data. For a simple example, if the geologic record indicates a high ratio of explosive to effusive eruption products at a particular volcano, then there is a relatively high probability of an explosive eruption in the future. These empirically-based methods have great value and should be expanded through database programs and efforts to improve and better populate eruption databases, the relevance of which cannot be overstated. In spite of the uncertainties, some progress in forecasting of magnitude and explosivity has been made in recent years. In a few cases, unusually rapid and large increases in seismic energy release, deformation rate, and changes in SO2 emissions have been used to forecast larger-than-normal eruptions, resulting in savings of tens of thousands of lives (Newhall and Punongbayan 1996; Surono et al. 2012). However, rapid increases preceded large eruptions by only short time spans and resulted in limited times for evacuations, and large increases in SO2 do not always correlate with eruption intensity (e.g., Miyakejima in 2000 (Kazahaya et al. 2004); Cotopaxi in 2015 (Hidalgo et al. 2018)). Changes in CO2 emissions, which started days to weeks in advance of explosive eruptions at Etna, Redoubt, and Merapi volcanoes (Aiuppa et al. 2007, 2010; Werner et al. 2013; Surono et al. 2012) offer promise as an early-warning indicator for some moderately explosive eruptions. Yet, because of its abundance in the atmosphere, there are significant analytical and logistical challenges in CO2 emission monitoring (Schwandner et al. 2017). Overall, there is wide agreement among volcano observatories that monitoring investments should be prioritized according to threat and risk (Ewert et al. 2005, 2018; Ewert 2007; Brown et al. 2015). To the degree that economic and logistical constraints permit, it is recommended that threat- or risk-based prioritizations of monitoring investments be used to establish resilient, multi-parametric monitoring networks for all high-threat volcanoes, while also striving to maintain at least minimal monitoring for all potentially active volcanoes in an observatory’s area of responsibility. In addition to well-instrumented laboratory volcanoes (“The case for laboratory volcanoes” section), it is important to stress that a minimal level of monitoring is needed to capture the full eruptive phase and provide near-term forecasts. In addition, the signs of early unrest can be subtle and one cannot know with certainty which volcano within an arc will enter unrest next. Because resources are not available to instrument all volcanoes at the laboratory volcano level, embedding at least minimal monitoring within strong regional seismic and deformation networks provides the best chance of catching the earliest phases of unrest and avoid “playing catch-up” with a reawakening volcano. As previously noted, eruptions involve complex natural processes that are difficult to forecast, and uncertainties are inherent and cannot be completely eliminated. It is therefore important to both reduce uncertainties as much as possible and carefully communicate remaining uncertainties to decision makers. Sharing of data and observations is particularly critical, as they constitute the objective knowledge of the phenomena that characterize volcanic unrest worldwide. The creation of open-access international databases of volcanic unrest and expansion of existing databases (e.g., VOTW; http://volcano.si.edu/) is therefore a crucial element to establish best practices at volcano observatories. It is important that databases include cases that both culminate and do not culminate in eruptions. Such databases will allow observatory scientists to determine whether the specific sequences they observe have been observed previously at other volcanoes, thereby quickly providing references for comparison. These databases also enable statistical analyses of patterns that may be used in forecasting. Examples include WOVOdat – the database of the World Organization of Volcano Observatories, www.wovodat.org and the Eruption Forecasting Information System (EFIS; Ogburn et al. 2016) of the Volcano Disaster Assistance Program (VDAP). It is recommended that databases of volcanic unrest adopt common standards and strive to be compatible with each other, so as to guarantee efficient searches and a consistent basis for comparison. Although the time constraints imposed by crises and limited staff time are recognized, it is further recommended that observatories make regular population of open-access databases a priority. Contributions may be facilitated through stand-alone versions of databases and through scripts that link and translate between observatory-based crisis-response databases and global databases – such programs are being implemented by WOVOdat (Newhall et al. 2017). Global eruption databases have the unique potential to provide the small as well as the larger and more-advanced observatories with complete, critical, and continuously up-dated knowledge on volcano unrest – knowledge that is important for effective forecasting. Sharing of experiences among volcano observatories is equally critical. A volcano observatory can easily experience substantial social and political pressure during an unrest crisis, when crucial decisions must be taken. Knowledge based on other observatory evaluations and forecasts for similar situations can help alleviate such pressure and lead to weighed decisions that include consideration of international practices. Regular communication among and dedicated meetings of scientists from volcano observatories (such as the VOBP workshops) are recommended as a common practice to improve specific and overall skills in near-term volcanic hazard forecasts. Additionally, regional and international sharing of technical and educational capabilities is encouraged; as such shared activities enhance the capacity of all observatories, independent of size and funding levels. Some volcanoes display remarkably similar behavior, even though separated by great distances. Such analogues provide attractive objects for comparative study, the objective of which is to understand the relationship of the volcano’s behavior to fundamental processes and characteristics, as opposed to random events. Examples include the remarkably similar collapse – blast – plinian eruption – dome-building sequences of Bezymianny in 1956 and Mount St Helens in 1980; the extended dome-building and block-and-ash flow eruptions of essentially identical crystal-choked magmas at Unzen in 1990–1995 and Kizimen in 2010; frequent dome growth and collapse at Colima, Merapi, Sinabung and Soufriere Hills; the rapid cone growth of tephra-rich basaltic volcanoes Fuji and Kliuchevskoi; the frequent lava eruptions from shallow magma reservoirs, with shield-building and slumping at oceanic plume-related basaltic volcanoes Kilauea and Piton de la Fournaise; and the recurrent unrest of Yellowstone, Campi Flegrei and other silicic calderas throughout the world. Although relatively small monitoring networks can be effective in revealing the onset of unrest and its escalation to an eruption, reducing uncertainties in forecasts requires the development of dense networks of multi-parametric instruments as well as knowledge from multi-disciplinary studies on individual volcanoes. Multi-parametric monitoring based on a combination of seismicity, geodesy (deformation and gravity), and gas and spring-water geochemistry data are proving to be effective in providing robust evaluations, but other parameters (e.g., from magnetotelluric and electrical conductivity surveys, and from petrologic and textural analyses of early-discharged juvenile magma) can provide additional constraints and result in improved forecasts. Recent developments in instrumentation and methods include: i) substantially increasing the sensitivity of networks, especially through the deployment of broad-bandwidth, near-vent, and borehole instruments and the development of data-processing techniques to separate coherent signals from background noise; ii) progressively filling a gap in the frequency spectrum of recorded signals corresponding to ultra-long-periods from minutes to hours at one extreme and infrasonic frequencies at the other extreme; iii) complementing ground-based observations with space-born monitoring, especially utilizing all-weather and day-night satellite radar data for change detection (e.g., through multiple backscatter images and Interferometric Synthetic Aperture Radar data). Advanced processing of multi-parametric data, including techniques such as tomographic modeling of seismic data and high-resolution inversion of geodetic data coupled with petrologic and geochemical information, provide knowledge of deep magmatic systems that is crucial for correctly interpreting monitoring signals and constraining models of volcano dynamics. Conceptual models are especially useful as a framework for understanding potential magmatic processes involved both short- and long-term assessments. At laboratory volcanoes, the enhanced monitoring and scientific investigations typically enables a greater understanding of magma genesis and transport (e.g., Wanke et al. 2019a, b). In near-term crisis assessment the resulting conceptual models provide a means to relate monitoring data trends to magmatic ascent and thereby aid in forecasting (e.g., Power et al. 2002, Power et al. 2013; Sparks 2003; Cashman 2004; Aiuppa et al. 2007, 2010; Iguchi et al. 2008; Biggs et al. 2009; Neri et al. 2009; Werner et al. 2013; McCausland et al. 2017; Sparks and Cashman 2017; Dzurisin 2018; White and McCausland 2019). In eruptions that span weeks to years and in which seismic, geodetic and gas monitoring data provide insights into the sub-surface magmatic system, and/or when near-real-time sampling can be accomplished in a safe manner (e.g., ash sampling), conceptual models can be revised and used in near-real-time for short-term forecasting and warning (e.g., Gaunt et al. 2017). These models are also useful in long-term hazard assessment, as discussed in “Conceptual models” section. Statistical and numerical models are important components of both long-term assessments and near-term forecasts at laboratory volcanoes. These models are discussed in detail in “Numerical and statistical models” section. Resources do not exist to implement comprehensive investigation and extensive monitoring of all the world’s potentially hazardous volcanoes. Moreover, the cost of installing and maintaining instruments and the time-span over which a variety of event observations can be expected to be captured varies greatly. Volcanoes that become attractive global laboratories are those that have one or more of the following characteristics: i) pose a significant risk that justifies the investments; ii) are frequently active so as to begin to return results soon after the investment is made; and iii) are easily accessible so as to minimize logistical costs. High quality multi-parametric data from a number of intensely monitored, deeply investigated natural laboratory volcanoes (Vesuvius, Campi Flegrei, Etna and Stromboli in Italy; Long Valley and Yellowstone calderas, and Mount St. Helens and Kilauea in USA; Soufrière Hills in Montserrat Island, Lesser Antilles; Unzen and Sakurajima in Japan; Merapi in Indonesia, Mayon in Philippines, and several others) allow the development of sophisticated conceptual and theoretical models of volcano behavior, and their testing through comparison with observations of unrest and/or eruption. Such models have the potential to: i) provide a robust framework for establishing relationships between surface observations and deep processes, thus leading to improved interpretation of monitoring data and guides for best development of monitoring networks at other volcanoes; ii) provide conceptual models of volcanic processes from lithosphere into the atmosphere, thus leading to deeper understanding of volcano dynamics and of the controlling roles played by multiple variables (e.g., magma composition/volatile contents, system geometries, volcano topography, local climate and wind circulation, etc. ); iii) provide scenarios for analysis of thresholds in monitoring parameters that result in hazardous processes. The examples of laboratory volcanoes cited here have contributed important insights into our understanding of eruptive processes. Additional laboratory volcanoes are needed to more fully explore the global range of activity and to enable more detailed comparisons. Not only do laboratory volcanoes provide data on magma dynamics unmatched in breadth and frequency of recurrence by other sites, but they serve as natural gathering places for teams from different countries to collaborate. They provide an effective situation in which to compare and validate methods, explore concepts and ideas, deepen understanding, and define successful practices for advanced monitoring and near-term forecasting. While it is important that the experience gained at laboratory volcanoes be transported to other dangerous volcanoes, the specificity of each volcano may represent a substantial difficulty. It can be complex to discern those characteristics that can be generalized to other volcanoes, even when of the same general type (e.g., long-dormant, frequently-erupting, calderas, etc.). Differences in system conditions at different volcanoes (e.g., in terms of extent and roles of hydrothermal circulation, system geometry at depth, magma compositions involved, magma and rock properties, etc.) are factors that must be taken into account as possible limits to straightforward extrapolations. A calibrated mix of observations, experience, theoretical and numerical studies is the key to useful understanding of unrest and forecasting of near-term hazards at a large number of volcanoes. Universities, as society’s primary engine for the creation, preservation, and passing on of human knowledge, represent a natural and, where available, indispensable ally of volcano observatories. This is especially true for neighboring universities, which by proximity will tend to have shared interests and more opportunities for interaction. In some cases, universities may also host a broader range of relevant expertise than an observatory can support. The faculty workforce may be large and flexible, usually with an ability (or requirement) to start and stop new projects faster than observatory scientists. Most of all, universities have students, who can provide strong, enthusiastic, and readily expandable support for an observatory in “peacetime,” or when appropriate, during a crisis. In turn, through collaboration with observatories, students can be motivated to become the geohazard scientists of tomorrow. For students, the experience of working in, or in association with, an observatory gives them a sense of directly applying the science they are studying for the public good. For the observatory, students can provide refreshing new talent and a counterforce to the cloistering effect of observatory structure. Students from a local university can also provide an important link between the observatory and the community the observatory serves. For some countries, the linkage between observatories and academia is natural because they are part of the same bureaucratic structure, even to the extent that the observatory is operated by a university or research institute (as in Japan, where the volcano observatories are maintained by universities and their data are shared with the Japan Meteorological Agency, which has responsibility for emergency management). In other cases, an observatory and its potential university partners are totally unrelated entities, so that institutional barriers must be overcome for close cooperation to occur. In the latter case, the observatory may have a strongly operational emphasis, and correspondingly fewer research and development components in its mission portfolio. Even when an observatory is part of an academic system, there often remain clear distinctions between being a faculty member and an observatory scientist. Faculty with teaching and other responsibilities cannot be totally dedicated to observatory functions except over short periods of crisis. On the other hand, observatory scientists with operational responsibilities may not be able to achieve the scientific research and publication output expected of their regular academic colleagues. Accommodations for these differences must be made in order to have an effective partnership. A more general issue for relations between observatories and universities is the collegial exchange of data and ideas. This is an area of rapid evolution (“Open-access to real-time or near-real time data” section). In the past, many observatories had a monopoly on data from the volcanoes they monitored. Observatories restricted dissemination of data, at least without substantial latency, for fear it would be misinterpreted leading to dangerous mixed messages and/or that others would profit inordinately by networks installed and maintained by observatory scientists. The alternative to embargoing or delaying release of data is to rely on the professionalism of the broader scientific community as noted by the IAVCEI Subcommittee for Crisis Protocols 1999; IAVCEI Task Group on Crisis Protocols (2016). Both of these two documents encourage collaboration among volcano observatories and outside scientists, but they also emphasize the importance of an observatory having a clear and consistent “single voice” during a crisis. Delivery of the same message from multiple observatory scientists and their civil protection partners is highly effective for consistent communication with the media and the public during a crisis. A common aim is to preserve the central mission behind the observatory concept – to maintain the voice of scientific authority upon which civil decision makers can base their actions, while also benefiting from all available science that is pertinent to understanding the causes and consequences of volcanism. The broader academic community is asked to defer to observatories as the collective scientific public voice during a crisis and to provide proper attribution for data and interpretations. Scientists will never be perfect in this regard; the temptation to respond to media questions with one’s own opinion can be great. Thus, the continued success of an observatory in maintaining an authoritative voice ultimately relies on its own credibility and an effective public outreach policy, especially if monitoring data are openly available. On the other hand, a closed data policy can lead to “conspiracy theories”, that the government is “hiding” worrisome information in order to control the population. A reciprocal relationship between universities and observatories also exists. Information acquired by university-based researchers working independently from observatories, whether nearby or distant, may be relevant to the observatory’s hazard warning mission. Consequently, it is important for academic researchers to share their data with observatories in a timely manner. Published papers, academic theses or reports are useful over the long-term, but in addition, providing the observatory with near-real-time data and interpretations can be critical during crises. Such reciprocity encourages collaboration, which in turn benefits both institutions. Sharing of data with and by university partners can significantly enhance and even correct premature or misleading interpretations of data. For example, although InSAR data are becoming easier to process, interpretation can be complex, with atmospheric and topographic effects that can be mistaken for signs of volcanic deformation. This can lead to potentially dangerous misinterpretation, both by members of the public who may access data via open-access portals and by non-specialist volcanologists. Similar statements are also true for many other types of monitoring data. Consequently, strong partnerships and open communication between partner universities and observatories are critical for effective research, practice, hazard understanding and hazard communication (e.g. Sigmundsson et al. 2015). The use of near-real-time multi-gas monitoring (Aiuppa et al. 2007), in which SO2, H2S and CO2 along with other gases are measured, either with remote stations or with aircraft (including drones) enables determination of the relative roles of magmatic degassing at deep versus shallow levels and the degree of interaction with hydrothermal systems and groundwater – factors that can be important in the interpretation and forecasting of potential explosivity (Edmonds 2008). Satellite remote sensing, especially using radar has greatly advanced our ability to detect and assess changes at volcanoes (Pyle et al. 2013; Biggs et al. 2014) and numerical modeling in combination with satellite remote sensing and ground-based LIDAR has resulted in improved ash cloud tracking as well as determination of mass eruption rate and concentration of ash (Dacre et al. 2011). Global use of Interferometric Synthetic Aperture Radar (InSAR) has provided early warning of volcanic unrest and magmatic intrusion (e.g., Neri et al. 2009; Dzurisin et al. 2009; Biggs et al. 2009; Chaussard and Amelung 2012; Lu and Dzurisin 2014), backscattered radar images from satellites have penetrated cloud cover and, in combination with in situ data, have contributed directly to saving thousands of lives during lava-dome eruptions (Surono et al. 2012; Pallister et al. 2013, 2018). Thermal sensing has enabled eruption detection, estimation of eruption rates and helped delineate extent of eruption products (e.g., Wright et al. 2001, 2002), and geostationary weather satellites routinely detect and track eruption clouds (e.g., Prata 2009). Over the past decade, drones have recently “come of age” and have contributed during crises to vent observations, digital elevation modeling and gas monitoring (e.g., Astuti et al. 2008; McGonigle et al. 2008; Shinohara 2013; Turner et al. 2017; Rüdiger et al. 2018). In spite of these advances, remote sensing was not a major topic of discussion during the VOBP workshops to date. We suggest that the subject is ripe as a topic for a future VOBP meeting (“New technological developments for monitoring and forecasting” section). At least minimal monitoring of all potentially hazardous volcanoes is needed to identify volcanic unrest, establish backgrounds and thresholds and enable useful forecasts of eruptions. Prioritization of monitoring according to a ranking of threat or risk (Ewert 2007; Ewert et al. 2018; Brown et al. 2015) is recommended. Expanded and multi-parameter monitoring, is also recommended as it reduces uncertainties and improves forecasts. For reference and comparison, definition of levels of monitoring (as considered appropriate for the U.S.) are reported in Moran et al. (2008). Most eruptions involve complex natural processes that are difficult to forecast with certainty. Consequently, it is recommended that observatories use probabilistic methods in their forecasts and communicate in appropriate ways their inherent uncertainties. Improved forecasts are achieved through sharing of data and experiences among observatories, and by comparative studies of volcanoes and eruption sequences. It is recommended that databases of volcanic unrest adopt common standards and strive to be compatible with each other, so as to enable efficient searches and a consistent basis for comparison. It is further recommended that a priority of volcano observatories should be to make regular contributions to open-access databases. Improvements in forecasting may be achieved through research into underlying magmatic processes on intensely instrumented “laboratory volcanoes,” leading to development of theoretical and conceptual models that aid in interpretation of monitoring data. Roles and responsibilities of observatories for the use of forecasts in mitigating risk should be clearly defined and consistent with national policy. Clear roles and responsibilities of each partner of the decision-making chain are critical for effective risk mitigation. Universities are natural partners for volcano observatories, and can potentially provide additional scientific expertise, personnel who can assist in a crisis, and neighboring universities provide an important avenue for regional educational benefit and community outreach. In order to facilitate partnerships, it is important for observatories and their university partners to recognize their distinct job responsibilities and to work out roles, responsibilities, and accommodations in advance of eruptions. To avoid potentially dangerous mixed messages, the responsibility for communication of hazards to emergency managers and the public remains with the responsible observatory (see VOBP2 section). During times of crisis, observatories can benefit from each of these recommendations, as illustrated in Fig. 5. Eighty-three participants representing volcano observatories and partner organizations from 26 nations participated in VOBP2 in Erice, Italy (Fig. 6; Additional file 1). A principal role and responsibility of volcano observatories is communication of hazard information on various time scales to decision-makers and, in many countries, to the media and public. Effective communication depends on clear distinctions of roles and responsibilities of observatories in relation to civil authorities and the broader scientific community, and on the prior definition and practice of efficient procedures for communication and risk mitigation in times of crisis. Effective communication of volcano hazards information is also key to establishing trust and credibility for the observatory in the eyes of civil authorities and the public. The issue of communication both during and between crises is growing in importance (Fearnley et al. 2018a, b). This reflects both an increase in risk as a consequence of greater societal exposure, and a growing demand for responsibility and cooperation in societies due to complex relationships among multiple actors with complementary roles. Clear, prompt, and efficient communication between responsible parties is critical to increase the effectiveness of the societal response to a crisis. In addition, the quality of communication between scientists, decision makers and the public during a crisis is not independent from the specific cultural and societal setting, even within a single nation (Andreastuti et al. 2017). Consequently, there is not one unique or best communication strategy that holds in all countries, especially considering the wide variability of societal settings in countries with active volcanoes. Nonetheless, many observatory scientists agree that there is a need for an authoritative international reference and recommendations, such as those presented here, to help identify critical issues and guide development of hazard communication methods, while also respecting the realities and constraints regarding volcano hazard communication in different countries. Further, there is a broad consensus that working relationships among observatories, civil authorities and communities during “peacetime” between crises enhances trusting and effective communication during crises. The need for an international reference concerning these factors was recognized as an urgent priority for future work by participants at VOBP1 in 2011, and consequently Communication of Volcanic Hazards became the focus of the second international Volcano Observatory Best Practices Workshop (VOBP2). Most observatories exist to produce evidence-based, scientific information and forecasts with associated uncertainties in a comprehensible format, i.e., actionable scientific advice. In most nations, it is not the volcano observatory that orders and enforces a civil action such as an evacuation, rather, it is civil law enforcement agencies and/or the military. Yet, in some cases the lines of responsibility become blurred. Civil or military authorities are expected to factor in broad logistical, economic, and sociological constraints in deciding on a major mitigation actions, weighing for example, the risks of evacuation against the risks of not evacuating. Volcanic forecasts, expressed as probabilities, are in the form necessary for these types of cost/benefit analyses and can aid in such decision making. Consequently, it is desirable and recommended that forecasts be expressed as probabilities (Marzocchi and Woo 2007; Papale 2017), either in quantitative or qualitative terms depending on the desires and capabilities of the audience (“Probabilistic forecasting...” section). Alert (or threat) levels are widely regarded as an efficient means of communicating levels of unrest and in some cases desired civic responses, and consequently they are widely used by governments world-wide. When linked to probabilistic and uncertainty analysis, alert levels have the advantage of a simplified message that is less subject to the moral and emotional dilemmas posed by requiring those at-risk to independently analyze the associated uncertainties (Merlhiot et al. 2018). Before releasing alerts, warnings or forecasts, observatory leader(s) and their civil protection partners should seek the best possible knowledge and a consensus about the situation among discipline experts, ensure that data and rationale for decisions are documented, and speak with a single/common voice. However, in crisis situations consensus must be achieved quickly. Rapid consensus is facilitated by preparation and practice of communication and collaboration procedures in advance of crises. For rapid and accurate information dissemination, observatories should convey hazard information in standardized formats and use direct modes of communication (e.g., public webpages, e.g., with front page alerts and warnings, social media, and automated messaging). Common formats used by many observatories include color-coded alert or status messages via web pages and in some cases by social media. Some observatories also issue public information bulletins to provide context or updates that do not require a change in alert level. Increasingly, observatories are using automated messaging systems for distribution of hazard information to key stakeholders; such systems are important especially in times of crisis to rapidly and simultaneously alert the many different entities who are part of a crisis-response community. In addition, many observatories engage in active hazard education and outreach programs, to help maintain awareness of hazards and where authorized, to engage with civil protection partners in socialization programs that prepare communities to respond appropriately to crises and thereby increase resilience. There is increasing recognition that communication by volcano observatories needs to suit a wide audience including those overseas for transboundary hazards. For example, special reports issued jointly by the Icelandic Met Office and Civil Protection in Iceland before and during eruptions now include a series of scenarios to enable planning by a wide variety of users in Iceland and in Europe. Volcanic Alert Levels (VALS) were considered during both VOBP1 and VOBP3. Because they are fundamentally a communication method, they are discussed here. VALs discretize the state of a volcano into a number of levels (usually three to five, but they can be more), which are sometimes also used to define when (and what) actions aimed at public safety should be put in place (Additional file 3). There is wide agreement that VALS provide a simple and valuable hazard communication method and they are used by most of the world’s observatories and/or their civil protection partners to alert the population to potential volcanic hazards. While there is wide agreement as to the value of VALs as communication tools, there is debate within the observatory community regarding who should be responsible for issuing them. Papale (2017) argues that their issuance by observatories may: i) imply predictive capabilities not supported by corresponding levels of confidence in the knowledge of the volcano, and ii) impose on the volcano scientist responsibility for decisions that may exceed his or her expertise and societal mandate. The first point is related to the degree of certainty that is implicit in some VAL language and to the discretization of what may be a continuous probability distribution. The second point relates to the discretized nature of VALs, implying, either implicitly or explicitly, an immediate link with actions aimed at mitigating risk. That link extends the role of volcano observatories beyond the typically limited range of expertise available to them (i.e., most are scientific and technical organizations that lack social-science and other required expertise), and in some countries, beyond the limits of their political mandate. The observatories represented at the VOBP workshops acknowledge these potential problems, and consequently, they work in close partnership with civil protection and political officials to develop site-specific protocols for VAL issuance and implementation. Currently, the majority of observatories represented at the VOBP workshops are responsible for issuing VALs; in other cases, their civil protection partners issue the alerts based on a range of information, in addition to the scientific information from the observatory (Additional file 3). A special case of communication that is increasingly under discussion involves the release of real-time (or near-real-time) geophysical data. In the past, most observatories kept these data internal. This allowed time for the interpretation needed make the data meaningful to the public. Also, as the sole source of data, the observatory was able to speak from a position of authority about the volcano and prevent potential misinterpretation of the data by others. However, new government policies and societal forces in some countries are now requiring open-access to monitoring data, and a number of meteorological and tectonic-seismological agencies have adopted open-data policies. While some national governments require open-access to data relevant to public health, safety, and prosperity, the range in data policies now in effect among observatories is from almost total openness to near-complete absence of real-time data-access. This is an area of change, and many in the natural hazards community recommend accepting that open-access to data is inevitable and should be embraced. Several observatories that are releasing real-time or near-real-time data report that the consequences of an informed public outweigh the risks, especially when open-access is coupled with a strong observatory-based public communication program (e.g., the MAGMA website and twitter application (https://magma.vsi.esdm.go.id/; https://twitter.com/id_magma). In effect, open-access to data requires a strong program of public outreach and education by the observatory – a function that also enhances trust between at-risk communities and the observatory. Regardless of official data policy, a monopoly on monitoring data is diminishing as observatories come to rely on data from outside sources, such as from satellites and from ground networks operated by others. Indeed, international organizations such as the Global Earth Observation System of Systems (GEOSS) and regional funding agencies such as the European Commission are pushing for open-access to real-time monitoring data of all kinds. As applied to volcanoes, an argument has been made that observatories cannot expect special access to radar satellite data, which is normally sold commercially, if they are unwilling to share data from their own ground-based systems. It is not so much that space agencies or space corporations are interested in the in situ data itself, although they may be for purposes of calibration and verification, but rather in the principle of open sharing of real-time observations of public interest, as is now done routinely in some nations for seismic data from tectonic networks. The release of certain types of data, e.g., Real-time Seismic Amplitude Measurement (RSAM; Endo and Murray 1991) plots, seismograms and web-cam imagery, if coupled with near-real-time interpretation and a strong and persistent media presence, is a means to maintain the observatory as the predominant and authoritative source for information. The challenge is that certain other types of data (e.g., InSAR images, raw gas measurements, and some types of seismic data) are particularly subject to misinterpretation and potentially to false alarms. Consequently, open-access imposes a time-pressure on the observatory to interpret monitoring data in as rapid a manner as possible, while also maintaining quality of interpretation. Yet during crises, not all observatories have the capacity to maintain effective near-term forecasting, while also responding to the many public inquiries and to misinterpretations by external parties that sometimes result from open-access to real-time raw data. There is currently no “one size fits all” answer to the question of open-access to real-time, or near-real-time, volcano-monitoring data. Consequently, we recommend that observatories provide open-access to data that does not require extensive interpretations (e.g., RSAM graphics and web-cam images), and strive to provide access to other data that require more extensive interpretation in as rapid a manner as possible. We note that an authoritative voice is achieved both because of governmental authority and because observatories that practice open-access generally also practice strong public outreach, education, and communication programs. In effect, they establish authority by being “out in-front” in terms of communication with communities at risk. A revolution that has occurred over the last decade is the explosive growth of social media. In some recent natural disasters, government response agencies have found themselves very much behind the public in gathering and disseminating observations. Some observatories have introduced use of Facebook, Twitter, WhatsApp and other social-media applications to keep the public informed. In turn, website interfaces can allow the citizenry to report observations, and social media can be mined for citizen reports. Unfortunately, there is also the potential for false and even dangerous reports that can emerge on social media from non-observatory sources during volcanic crises, and as with open-access to data, observatories must be vigilant to detect and correct potentially dangerous misinformation that arises via social media. The use of citizen scientists in observing and reporting data is most advanced for tectonic earthquakes. It can be further exploited by volcano observatories for reporting ashfalls, gas, incandescence, and other volcanic phenomena, and some observatories and volcano databases are already taking advantage of these opportunities (e.g., Stone et al. 2015; Sennert et al. 2015). And even without social media, local populations can serve both as citizen scientists and as effective local community leaders in risk mitigation. This is demonstrated by the vigías of Tungurahua, Ecuador, who use VHF radios to communicate their observations to the population at risk and to the Instituto Geofisico. They increase community awareness and preparedness and serve as an early-warning system for civil protection (Stone et al. 2015). Although not a major topic during VOBP2, we anticipate that future VOBP meetings may devote considerably more time to the subject of social media and citizen science (“Volcano observatories and the media” section). A central theme of VOBP1 and VOBP3 was in acknowledging the inherent uncertainty in eruption forecasting and the consequent need for forecasts to be probabilistic in nature (“Probabilistic forecasting...” and “Essential components...” sections). However, the communication of uncertainty can be challenging. The scientific concept of uncertainty may be different from the understanding of stakeholders. Uncertainty to a “layperson” implies that one cannot say with confidence that a particular outcome will or will not happen; uncertainty to a scientist means that a more- or less-quantifiable range of outcomes are possible. Neither is wrong, per se, but they highlight the need for “translation” of technical or mathematical expressions of uncertainty and building a common language between scientists and stakeholders to avoid misconceptions and misinterpretations. Use of scenarios and explaining probabilities and their associated uncertainties in relative terms can be useful. Again, this is an area in which communications between observatory scientists and mitigation decision-makers during the “peacetime” between crisis can avoid misunderstandings during crises. In addition to the issue of understanding of the definition of uncertainty, too much emphasis on the uncertainty of forecasts can undermine credibility (Merlhiot et al. 2018), yet too little emphasis can lead to overconfidence and over-reaction by civil authorities, which in turn can result in a loss of credibility. Among the many lessons learned after the L’Aquila earthquake that struck central Italy in 2009 is the importance of including even very low-probability events in communications (Jordan 2013; Cocco et al. 2015) and the need for standards of practice (Bretton et al. 2015, 2018a, b). Following established and well-documented communication procedures is simply good-practice, critical for observatories to maintain credibility, and can serve as a legal basis for demonstrating that the institution has operated within the scope of its authority. Such procedures should be formulated with consideration of factors such as how the observatory will communicate uncertainty and reporting of low-probability but high-impact events. There is a clear consensus on the concept that communication and responsibility are closely related: with regard to societal risk, each involved group communicates what it is responsible for; or said the other way round, the content of the communications defines the responsibility of the communicating party. As already noted, the responsibilities assigned to volcano observatories change from one country to another, according to local culture, societal constraints and regulations. As a consequence, the content of communications by volcano observatories varies. In some countries the authority responsible for mitigation decisions that have a major impact on the society, is different from the volcano observatory. In such countries, communications by volcano observatories should not include statements on actions like access closure, interruption of social or commercial activities, etc., which do not form part of their responsibilities. These observatories, instead contribute to reaching those decisions with their forecasts representing their expert advice on the volcano state and its possible evolutions. This is not the case in other countries in which observatory VALs are issued that in addition to information on the state of the volcano, also include mitigation advice (Additional file 3). In these countries there is a shared responsibility between the observatory and those responsible for decisions related to mitigation actions. Observatories and emergency managers are partners in the mitigation of risk. Observatories work with emergency managers in advance of crises to develop response and contingency plans that stipulate roles, responsibilities and authorities of both parties, defining what is required of each party, according to their know-how and societal mandates and in order for the society to benefit from best practices and established protocols in reaching decisions. The primary goal of a constant communication practice between volcano observatories and stakeholders is to ensure that the conveyed messages are correctly received, especially in times of crisis when delays or misunderstandings can have disastrous consequences. Equally relevant is for volcano observatories to understand what knowledge stakeholders need most, so to ensure that messages are tailored to the most relevant and most urgent needs. Developing a common language and mutual understanding, e.g. between volcano scientists and political decision makers, is also of paramount relevance to maximize efficiency and effectiveness of communications in times of crisis. Building up such relationships and mutual understanding requires time and effort, which is more than repaid by the positive effects on the interests of all parties. There is also agreement that personal investment by local communities in response and mitigation planning is critical, both to ensure effective near-term crisis response and to reduce risk as a consequence of long-term hazard assessment. In spite of this agreement, there is frustration in many nations concerning a lack of commitment by communities and governments with respect to land-use and environmental planning; especially in regions of great population pressure and high risk tolerance. However, there is agreement concerning the importance of perseverance and the resulting incremental gains that can be achieved. Although major volcanic eruptions can cause large-scale disasters, in any one locale they may be rare, spaced out over intervals of generations or even many lifetimes. In these situations, a continuous educational process for decision makers and the public is especially important so they are able to understand and respond to warnings. Places on Earth that are now well-populated may not have had a local eruption during recent history and in such places it is likely that there has been no learning by experience, increasing the vulnerability of the population and the importance of learning through simulated events. For example, the need for continuous education on volcanic hazards is important in the Pacific Northwest of the U.S., where eruptions are rare, but populations in some hazard zones are large. Here, binational exchanges (Mangan et al. 2016; Driedger et al. 2018) have provided a means for officials and communities who have experienced volcanic disasters (e.g., in Colombia and Chile) to pass along their experiences and to illuminate the potential hazard to those at risk in communities in the U.S. that have experienced rapid growth near long-dormant, but potentially hazardous volcanoes. The following guidelines can help prevent outcomes in which late, misdirected, or misunderstood warnings have resulted in needless fatalities: (1) Planning for a crisis must take place during a calm period (“peacetime”). It is difficult, if not impossible, to play “catch-up” when a crisis is underway and the press of events prevents full and careful discussion and organization among multiple partners who do not already know and trust one another. Because observatories are the source of deep, long-term institutional knowledge of the volcanoes and volcanic hazards in their area of responsibility, this institutional knowledge should be used to promote awareness, preparation, and coordination in peacetime. This can be accomplished through a range of education, outreach and practice of crisis management with partners, such as through table-top exercises involving the many stakeholders and partners involved in crisis management. (2) Planning for a crisis should entail identifying roles and responsibilities and points of contact for each entity. The universal observatory role is to provide a single, clear voice of scientific authority based upon comprehensive analysis and objective consideration of all available data. (3) Critical communications should be designed to pass essential information in an understandable and standardized format by the most direct (fastest) route. Two-way communication is important to ensure that information is understood and appropriate actions are taken at both ends. (4) Both response and recovery actions should be identified and discussed. (5) Ideally, a response plan should be written and updated at regular intervals by a standing working group. Some sort of periodic exercise, ranging from “table top” to full-scale enactment may be carried out regularly to identify problems and to remind people of their appropriate actions. Repetition is important, not just because of the human tendency to forget but also because there is often high turnover of personnel in many non-scientific organizations, for example, in the military, local governments and embassies. Exercises also serve to foster communication from decision makers to observatories about critical infrastructure, which may require increased efforts to be included in forecasts as well as to jointly identify secondary impacts (e.g., loss of power, spillage of fuels, loss of transportation links, and pollution of water supplies, etc.). In addition, such exercises benefit from consideration of cascading hazards and long-term effects of eruptions (e.g., rainfall-induced lahars, which can persist for decades after large eruptions). Such exercises are an effective means to facilitate the constant engagement between observatories and civil authorities that is considered essential for effective mitigation of risk during future volcanic crises. It is widely recognized that Disaster Risk Reduction (DRR) can only be achieved if the population at risk is aware of the hazard and knows how to respond in a crisis. This is best achieved if governments and communities work together to reduce vulnerability (Paton et al. 2008; Andreastuti et al. 2017). A wide range of actors play a role in DRR at the community level (observatories, civil protection officials, community leaders, members of the media, non-governmental organizations, law enforcement officials, etc.). Virtually all observatories play a role in community education by providing information about the nature and extent of volcanic hazards; i.e., in communicating their long-term hazard assessments and zonation maps in ways that are appropriate to the particular community audiences. This is done both passively through publication and web-site-based content, and actively through in-person education programs and social media. In addition, all observatories contribute hazard information to civil protection and public officials who are responsible for mitigation of risk. Where authorized to do so, observatories go farther, working closely with civil protection and local communities to design and implement volcanic-emergency response or contingency plans and to contribute to, or co-lead, emergency response exercises, Many lessons have been learned from volcanic crisis simulation exercises, e.g., the MESIMEX simulation at Vesuvius in 2006 (Ricci et al. 2013), the Campi Flegrei simulation exercise in 2014 (Papale et al. 2014), and many others throughout the world. It is clear that the lessons of Nevado del Ruiz (Voight 1990) have not been forgotten; a major VOBP recommendation is that observatories continue to communicate volcanic hazard information and to work in partnership with other officials to reduce communities’ vulnerability to volcanic hazards. The growing impacts of volcanic activity on aviation increase the importance of rapid notification of volcanic ash-producing eruptions by observatories and volcano observatories now play a more active role in aviation safety at local to international levels. For example, the international civil aviation community has requested rapid warnings of ash plumes as a new goal for Volcano Observatory Notice to Aviation (VONA) alerts. In addition to reporting on ash-producing eruptions, observatories and their partners now also use satellite data to detect explosive eruptions, track ash-clouds and forecast ashfall (Prata 2009; Pyle et al. 2013). Responding to incidents in the 1980s and 1990s when several passenger jet aircraft lost all power during encounters with ash clouds, volcano observatories, meteorological agencies and aviation sector partners evaluated the causes of these near-disasters and proposed mitigation strategies (Casadevall 1994). One of the results was the creation of a network of Volcanic Ash Advisory Centers (VAACs) in the 1990s specifically to monitor volcanic ash clouds and provide warnings to pilots and airlines. This network, now consisting of 9 VAACs and not directly tied to volcano observatories, was established under the authority of the International Civil Aviation Organization (ICAO), an agency of the United Nations that develops policy and protocols for international aviation through participation of aviation agencies of member states. Each VAAC is operated as an office of the weather agency for the country in which it resides. VAACs conduct satellite surveillance of volcanoes and acquire eruption and ash cloud reports from pilots and volcano observatories. Based upon this information, which ideally includes information about eruption characteristics and parameters from the relevant volcano observatories, VAACs issue forecasts for ash-cloud distribution in space and time. Aviation agencies and airlines then use this information for flight planning, which may include diverting or cancelling flights in the case of significant ash eruptions. In order for the VAACs to be prepared to rapidly issue ash-cloud warnings, a formal message format called the Volcano Observatory Notice to Aviation (VONA) was developed and adopted by ICAO as the message protocol for volcano observatories to use in communicating with VAACs and the aviation sector at large. Through these notifications, volcano observatories are empowered to issue color-coded alert notifications for volcanic activity, along with any available information on ash-plume heights. In addition to the VONAs, some volcano observatories also conduct ash-cloud dispersion and deposition models and they conduct field and laboratory studies to evaluate the hazards of ashfall, and to validate models. Along with other stakeholders, they provide forecasts and related information to the VAACs. Strong relationships between observatories, regional VAACs and national meteorological agencies are mutually beneficial, as reports from the meteorological agency to the observatory can help with volcanic hazard analysis. (e.g., reports on ash plume heights and distribution based on ground-based and satellite weather radar data). In April 2010, an eruption began at Eyjafjallajökull volcano, in Iceland, that eventually cost the European economy about 5 billion Euros (Ragona et al. 2011). The eruption was only moderately explosive, but it was long-lived and at a time when the ash was carried towards Europe by a stable weather pattern. The protocol for jet aviation at the time was to avoid operations in ash-contaminated airspace, and most flights in European air space were canceled for several days. At the center of this crisis were the London VAAC and the Iceland Meteorological Office, Iceland’s volcano observatory. This event emphasized that volcanic-ash eruptions are an international problem, and present a threat not only to individual aircraft and their passengers, but also to the aviation industry and national economies. As a result, ICAO set up an International Volcanic Ash Task Force (IVATF) to make recommendations for mitigating ash risk to aircraft and managing this type of crisis. IVATF’s deliberations include recommendations for volcano observatories on the monitoring of volcanoes and the timing and content of eruption reports (VONAs) to VAACs. It is important therefore, that volcano observatories understand their responsibilities in regards to aviation safety in order to properly engage the domestic and international aviation community. Any major ash eruption can be expected to have multi-national impacts to aviation. A critical role for observatories is to rapidly communicate eruption information to the aviation community through the use of VONAs. As noted in the introduction to this paper, the synergy that results from sharing of data and expertise between observatories and between universities and observatories is of great value. This is true both in terms of database contributions (“Probabilistic and deterministic aspects of databases” section) and in terms of personnel exchange and training. Because the frequency, magnitude, and style of eruptions and their impacts varies widely from place to place, the experience and expertise of observatory staff also varies widely. In addition to sharing of data and experience through international science meetings, VOBP workshops and regional or international workshops and training programs provide a means for more in-depth sharing of applied aspects of observatory operations and crisis management. Examples include workshops and training programs hosted by LAVAS (McCausland et al. 2014), CSAV (Thomas and Bevins 2015), NOVAC (Galle et al. 2010), the IAVCEI Hazard Mapping Working Group (Calder et al. 2017), La Asociación Latinoamericana de Volcanología (ALVO; https://vhub.org/groups/alvo) and others. Exchanges of staff between observatories and between observatories and university partners can also aid in the exchange of knowledge and technology, as has been demonstrated widely, examples include regional cooperation in crisis response and monitoring infrastructure development projects between observatories in Latin America and improved lava flow modeling techniques acquired through exchange visits of Hawaiian Volcano Observatory scientists and lava-flow modeling experts at INGV facilities in Rome, Pisa, and Catania. To guarantee objectiveness in their evaluations and before releasing alerts, warnings, or forecasts, observatory leader(s) seek the best possible knowledge and a consensus about the situation among discipline experts, ensure that data and rationale for decisions are documented and available for scrutiny, and speak with a single/common voice. In crisis situations consensus must be achieved quickly. Rapid consensus is facilitated by preparation and practice of procedures in advance of crises. For rapid and accurate information dissemination, observatories convey hazard information in standardized formats, use probabilistic analyses (“Probabilistic forecasting...” section) and use direct modes of communication (e.g., public webpages with front page alerts and warnings, social media, and automated messaging). International formats have been adopted for Volcano Observatory Notifications to Aviation (VONAs) and provide a good example of the value of standardization, especially for ash hazards, which cross international borders. To maximize the use of hazard forecasts from volcano observatories for risk mitigation purposes (e.g., via evacuations, re-routing air traffic, etc. ), observatories should communicate directly and regularly with mitigation authorities (e.g., emergency management and civil defense agencies, police and military, VAAC’s, aviation authorities) at all appropriate levels (national to local). Further, observatories should continue to communicate with communities to reduce vulnerability to volcanic disaster. To build up a common language and understanding and to establish trust and credibility, observatories engage with stakeholders (from civil authorities to the general public) at all phases of the emergency cycle; ensure constant flow of information; continuously evaluate and improve effectiveness of communication strategies; and communicate messages tailored to the specific stakeholders, keeping such messages meaningful. A number of sources for improving public communication of technical information are available in the social science literature, as well as from scientific organizations (e.g., https://sharingscience.agu.org/jargon-and-how-to-avoid-it/). Sharing of data and expertise, and participation in regional and international workshops and training programs is recommended, as it enhances observatory capabilities. For communities that have not experienced an eruption, but that are exposed to a significant threat from a long-dormant volcano, observatories would be well served to conduct periodic hazard-awareness and crisis response education programs with their civil protection partners, to increase community resilience. Given limited resources, it is important to prioritize such preparedness work according to level of threat. Finally, there is a need to clearly identify the roles and responsibilities of observatory scientists and civil protection decision-makers with respect to mitigation actions. In some nations, the former are restricted to expressing their understanding of the uncertainties involved in hazard forecasts and possible scenarios, and the latter make decisions taking into account the inherent uncertainty involved in forecasting eruptive behavior, as well as other practical, social and political factors. In other nations, observatory scientists play a more direct role in assisting civil protection authorities with risk mitigation decisions. Because of the close relationship between communication and responsibility, the observatory should carefully construct its communications to be consistent with its responsibilities. A flow chart illustrates how these recommendations come into play during communication of hazard alerts and forecasts (Fig. 7). There is a long list of emerging issues and topics that are appropriate for future VOBP workshops. Here we list a few examples. The subject of VOBP3 was long-term hazard assessment, not specifically vulnerability and risk assessment, although these subjects are intimately related. In terms of the limited history of volcano observatory engagement in risk mapping, the first use of conditional probabilities in the construction of volcanic risk zones we know of was the work by Chris Newhall at Mount St. Helens shortly after the 1980 eruption (Newhall 1982). Roberto Scandone’s map of volcanic risk related to explosive and effusive volcanic phenomena and eruptive vents at Vesuvius was the first we know of to take into account societal risk on a full population basis (Scandone et al. 1993). Communicating conditional probabilities and related risk maps to non-specialists can be a challenge, especially where low probabilities (<< 1%) are involved. However, at Mount St. Helens in 1980, a risk ladder, which compared volcanic risks to those of more common activities, proved to be an effective way to communicate such low probabilities and resulted in a decision to harvest downed-trees in part of the 1980 blast zone (Newhall and Pallister 2015). It is also the case that certain emergency management and political officials are familiar with probabilistic risk assessment and they need quantitative probabilistic analysis of risk. There are wide differences in responsibility and mandate regarding work by observatories on the evaluation of vulnerability and risk, yet, there is wide agreement with respect to the value and need for such evaluations, especially with respect to affecting changes in human behavior and in motivating political action, whether related to decisions to evacuate, land-use restrictions, or return to areas previously devastated. Although many observatories have legal responsibilities for volcano hazard warning, during VOBP3 it was emphasized that courts’ and politicians’ decisions rarely reflect an adequate understanding of volcanic hazards, probabilities, vulnerability and risk. It was further noted that a scientist’s view of what is needed in a hazard assessment or hazard map can be quite different from the needs of the public and public officials. 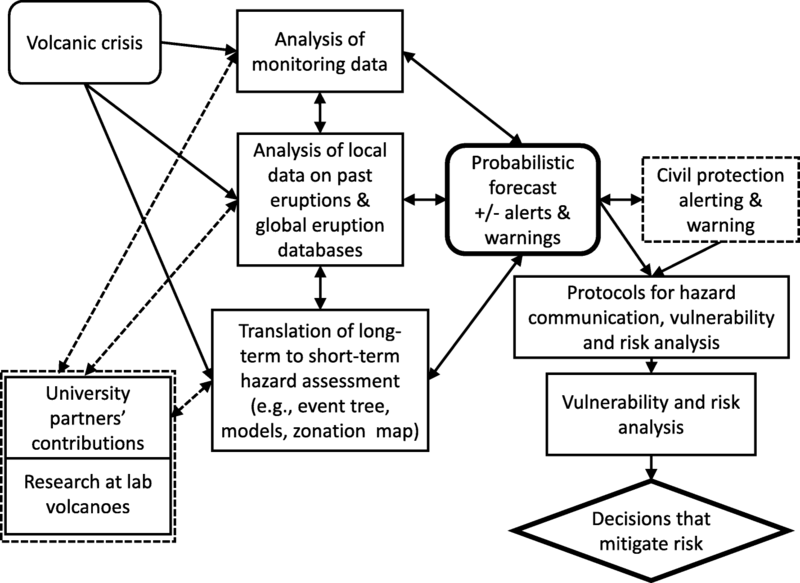 Consequently, observatory scientists need to take into account the social and cultural context of hazard assessments and work with communities and other partners to understand how the volcano hazard fits into their risk tolerance (Cronin et al. 2004; Solidum and Duran-Alegre 2011; Andreastuti et al. 2015). The degree to which observatories currently contribute directly to assessing vulnerability and risk assessment varies considerably depending on mandate. For example, in some nations (e.g., Japan), hazard zonation maps and posters already include specific recommendations or instructions regarding routes and facilities to use during evacuations, as well as other information about mitigation. These products are prepared by or in partnership with emergency managers and communities. Indonesia has long used a standard 3-part zonation in their hazard maps, and in some cases, the Indonesian government has linked the mapped hazard zones directly to mitigation actions, such as the definition of the highest hazard zone as a “forbidden zone” by the government at Merapi volcano (Thouret et al. 2000). However, in other nations, such as Italy, responsibility for risk analysis lies outside of the volcano observatory institution (Papale 2017). In addition to risk to human life and state of health, there is also the subject of risk to infrastructure and the economy. Currently, the Global Earthquake Model group is working in partnership with the Colombian Geological Service (SGC) and the Philippine Institute of Volcanology and Seismology (PHIVOLCS) and other members of the Global Volcano Model network to enhance available exposure data for both volcanoes and earthquakes and to enhance resources for calculation of risk to particular hazards. The potential future role of observatories in vulnerability and risk assessment, either directly, or indirectly through partnerships, is a potential topic for a future VOBP meeting. Although VOBP2 was on communication of hazards, much of the discussion and recommendations focused on the roles and responsibilities of observatories with respect to hazard alerts and warnings, with relatively little attention devoted to communication with the media. Yet collectively, observatories have amassed extensive experience over the past decades in public communication and use of social media. Examples include: strategies used by the USGS in dealing with extensive media coverage of the 2004 eruption of Mount St. Helens and the 2018 eruption of Kilauea, to the implementation of smart-phone technology to provide customized evacuation routes to the public during the eruptions of Cotopaxi in 2015 (by Instituto Geofisico and partners in Ecuador), to CVGHM’s smart-phone enabled national volcanic alerting and information system (MAGMA, https://magma.vsi.esdm.go.id/) in Indonesia. Many observatories now have Facebook and Twitter pages and are increasingly using public reporting and direct communication for both real-time monitoring and real-time communication of hazards. The topic of volcano observatories and the media is ripe for a discussion at a future VOBP meeting. Collectively, the world’s volcano observatories have extensive experience in crisis operations, yet with the exception of sharing of experiences at international scientific meetings, there is only limited direct sharing of crisis-response strategy and lessons-learned between observatories. In addition, some observatories have frequent eruptions and crisis experience, whereas, others may only have to deal with a dangerous eruption once a decade. Lessons learned about crisis operations range from strategies to maintain an authoritative single observatory voice, to the importance of a Public Information Office (PIO) and Incident Command System (ICS; https://training.fema.gov/emiweb/is/icsresource/assets/reviewmaterials.pdf), to ways to capitalize on research opportunities and enhancement of monitoring while not compromising safety. Members of VOBP3 selected the topic of volcano observatory crisis operations as the subject for VOBP4. A number of technological developments have emerged over the past few decades that offer great promise to improve volcano monitoring and forecasting. These include major new developments in remote sensing, ranging from the application of InSAR and GPS networks to monitor and interpret volcanic deformation (Hooper et al., 2004; Segall 2013; Lu and Dzurisin 2014; Biggs et al. 2014), to advances in the monitoring and interpretation of multiple volcanic gas species, to the use of drones for DEM generation and gas monitoring (“New technologies that contribute to forecasts” section), to more exotic methods such as the use of muon imaging (Tanaka et al. 2007). Advances in research drilling of volcanic systems is now primed to offer “ground truth” for magmatic models and new insights into the brittle-ductile interface between host rocks and magma – a zone that must play a major role in degree to which the surface expression of volcanic deformation records magmatic recharge (Lowenstern et al. 2016; Eichelberger et al. 2016). New developments in numerical and probabilistic modeling are also leading to improved forecasting, examples include new models of lava flow advance and machine-learning algorithms that automatically process monitoring data to forecast lava fountains, and improved ash dispersion and accumulation models that utilize real-time weather forecasts, etc. Some of these technologies have direct application in volcano observatories; others will advance understanding of volcanic systems and thereby contribute to the conceptual and numerical models used in assessment of hazards and in forecasting. We suggest that a future VOBP workshop on new technologies and their potential applications by volcano observatories is timely and would be useful in the evaluation and sharing of these new technologies and methods. The three VOBP workshops to date on long-term hazard assessment, near-term forecasting, and hazard communications have strengthened international relationships between volcano observatory scientists and improved understanding of the variety of the operational contexts (scientific, political and social) under which observatories operate. Through VOBP presentations and discussions, a series of recommended best-practices are made, which are based on practices and suggestions of the majority of the world’s volcano observatories. Common themes, among these 22 recommendations (“Summary of VOBP3 best practice recommendations”, “Best practice recommendations – a guide to improved forecasting” and “Summary of VOBP2 best practice recommendations” sections and summary in Table 1) include a call for increased emphasis on: i. probabilistic forecasting and appropriate treatment and communication of uncertainties, ii. development and use of global databases, iii. Prioritization of investments in monitoring infrastructure based on levels of threat, and enhanced multi-parameter monitoring to reduce uncertainty in forecasting, iv. partnerships between observatories and universities, v. more effective hazard communication and a clear definition and distinction of roles and responsibilities of observatories and mitigation authorities, vi. a next-generation of hazard maps and assessments that address the full range of potential eruptive activity, include model-based information (conceptual, statistical and numerical) and are informed by evaluation of risk. VOBP workshops are the only international meetings focused exclusively on volcano observatory activities and that bring together leaders of the world’s volcano observatories. Future VOBP meetings will address additional critical topics selected by the assembled observatories, and will result in additional best-practice recommendations. We anticipate that the VOBP recommendations will guide future priorities of the world’s volcano observatories and will ultimately help reduce the impacts of volcanic eruptions globally when implemented worldwide. We thank the many VOBP attendees for their contributions, not only to the spirited discussions during the meetings, but also more broadly for their commitment and dedication to the practice of applied volcanology and volcano observatory operations. In this review, we have attempted to capture the overall sense of the meetings and to present resulting best-practice recommendations of the assembled observatories to the best of our ability. Draft reports for VOBP1 and VOBP2 were distributed to VOBP3 participants prior to that workshop, comments solicited and were used to improve this document. 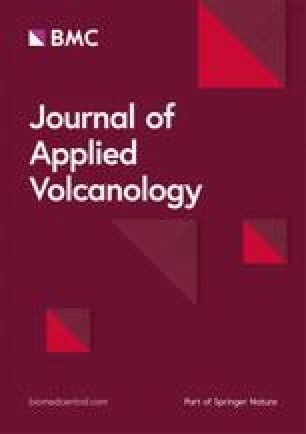 We especially appreciate constructive reviews of early drafts of this manuscript by Richie Robertson and Jessica Ball and by the Journal of Applied Volcanology reviewers: Steve Sparks, two anonymous reviewers and Editor Jan Lindsay. Funding for this work has been provided by the U.S. Geological Survey, the Istituto Nazionale di Geofisica e Vulcanologia, and the United States Agency for International Development – Office of Foreign Disaster Assistance. These agencies and the International Association of Volcanology and Chemisty of the Earth’s Interior (IAVCEI) have supported the VOBP workshops. Information and data used in this manuscript are available in cited papers and observatory records. Additional notes concerning the VOBP workshops is available from the first author. All authors contributed to the preparation and drafting of various parts of the manuscript. JP and PP are responsible for the final compilation, taking into account the contributions, suggestions, and reviews of the other coauthors and VOBP attendees. All authors read and approved the final manuscript. Aiuppa A, Burton M, Caltabiano T, Giudice G, Guerrieri S, Liuzzo M, Murè F, Salerno G. Unusually large magmatic CO2 gas emissions prior to a basaltic paroxysm. Geophys Res Lett. 2010;37. https://doi.org/10.1029/2010GL043837. Andreastuti S, Paripurno E, Gunawan H, Budianto A, Syahbana D, Pallister J. Character of community response to volcanic crises at Sinabung and Kelud volcanoes. J Volcanol Geotherm Res. 2017. https://doi.org/10.1016/j.jvolgeores.2017.01.022. Auker MR, Sparks RSJ, Siebert L, Crosweller HS, Ewert JW. A statistical analysis of the global historical volcanic fatalities record. J Appl Volcanol. 2013;2:2. https://doi.org/10.1186/2191-5040-2-2. Bretton RJ, Gottsmann J, Aspinall WP, Christie R. Implications of legal scrutiny processes (including the L’Aquila trial and other recent court cases) for future volcanic risk governance. J Appl Volcanol. 2015;4(18). https://doi.org/10.1186/s13617-015-0034-x. Cashman KV. Volatile controls on magma ascent and eruption. In: Sparks RSJ, Hawkesworth CJ, editors. The state of the planet: frontiers and challenges in geophysics. AGU geophys monogr series, vol. 150. Washington D.C; 2004. p. 109–24. https://doi.org/10.1029/150GM10. Eichelberger JC, Dingwell DB, Ludden JN, Mandeville CW, Markusson S, Papale P, Sigmundsson F. Krafla magma testbed: an international project crossing the scientific frontier from geothermal system into magma. In: Am. Geophys. Union Fall Abst. V51C-03; 2016. http://adsabs.harvard.edu/abs/2016AGUFM.V51C..03E. Fee D, Matoza RS. An overview of volcano infrasound: From hawaiian to plinian, local to global. J Volcanol Geotherm Res. 2013:123–39. https://doi.org/10.1016/j.jvolgeores.2012.09.002. Global Volcanism Program. In: Venzke E, editor. Volcanoes of the world, vol. 4: Smithsonian Institution; 2013. p. 6.7. https://doi.org/10.5479/si.GVP.VOTW4-2013. Downloaded 1 June 2018. Hooper A, Zebker H, Segall P, Kampes B. A new method for measuring deformation on volcanoes and other natural terrains using InSAR persistent scatterers. Geophys. Res. Lett. 31, L23611. https://doi.org/10.1029/2004GL021737. McCausland WA, Gunawan H, White RA, Novianti I, Patria C, Suparman Y, Putra A, Triastuty H, Hendrasto M. Using a process-based model of pre-eruptive seismic patterns to forecast evolving eruptive styles at Sinabung Volcano, Indonesia. J Volcanol Geotherm Res. 2017. https://doi.org/10.1016/j.jvolgeores.2017.04.004. Miller CA, Jolly AD. A model for developing best practice volcano monitoring: a combined threat assessment, consultation and network effectiveness approach. Nat Hazards. 2014;71(1):493–522. https://doi.org/10.1007/s11069-013-0928-z. Neri M, Casu F, Acocella V, Solaro G, Pepe S, Berardino P, Sansosti E, Caltabiano T, Lundgren P, Lanari R. Deformation and eruptions at Mt. Etna (Italy): a lesson from 15 years of observations. Geophys Res Lett. 2009;36(2). https://doi.org/10.1029/2008GL036151. Pallister J, Wessels R, Griswold J, McCausalnd W, Kartadinata N, Gunawan H, Budiano A, Primulyana S. Monitoring, forecasting collapse events, and mapping pyroclastic deposits at Sinabung volcano with satellite imagery. J Volcanol Geotherm Res. 2018. https://doi.org/10.1016/j.jvolgeores.2018.05.012. Ripepe M, Marchetti E, Donne DD, Genco R, Innocenti G, Lacanna G, Valade S. Infrasonic early warning system for explosive eruptions. J Geophys Res. 2018. https://doi.org/10.1029/2018JB015561. Sigmundsson F, Hooper A, Hreinsdóttir S, Vogfjörd KS, Ófeigsson BG, Heimisson ER, Dumont S, Parks M, Spaans K, Gudmundsson GB, Drouin V, Árnadóttir T, Jónsdóttir K, Gudmundsson MT, Högnadóttir T, Fridriksdóttir HM, Hensch M, Einarsson P, Magnússon E, Samsonov S, Brandsdóttir B, White RS, Ágústsdóttir T, Greenfield T, Green RG, Hjartardóttir AR, Pedersen R, Bennett RA, Geirsson H, La Femina PC, Björnsson H, Pálsson F, Sturkell E, Bean CJ, Möllhoff M, Braiden AK, Eibl EPS. Segmented lateral dyke growth in a rifting event at Bárðarbunga volcanic system, Iceland. Nature. 2015;517:191–5. https://doi.org/10.1038/nature14111 (online December 15, 2014). White R, McCausland W. A process-based model of pre-eruption seismicity patterns and its use for eruption forecasting at dormant stratovolcanoes. J Volcanol Geotherm Res. 2019. https://doi.org/10.1016/j.jvolgeores.2017.04.004.